I have put a pause on this project as it was taking more weeks than planned, but we will DEFINITELY get back to it – we have such a great start! I can follow the process of creating this “illusion”, being careful to follow the same lines every time, to and from the dots. I can use shading techniques to further the illusion of depth. 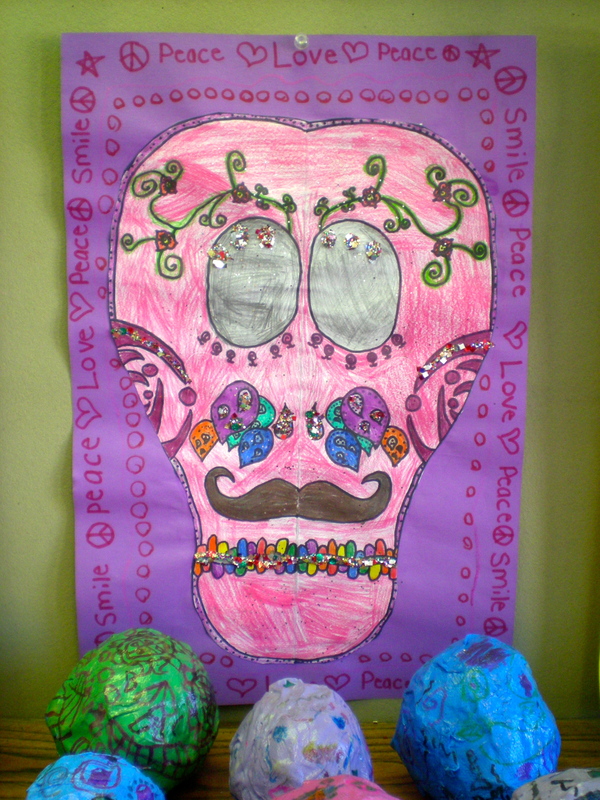 These Sugar Skulls (calaveras) inspired by Dia de los Muertos were an extended study of two-dimensional versus three-dimensional art, as well as symmetrical versus asymmetrical design. 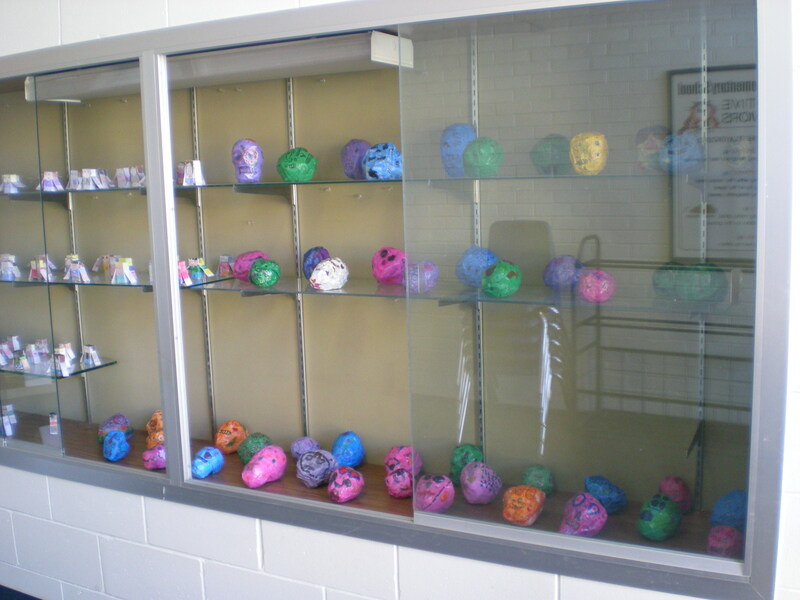 Because our students have the privilege of learning the Spanish language throughout elementary school, they are already familiar with the holiday of Dia de los Muertos, and it’s interesting to see their knowledge expressed in a tactile way. 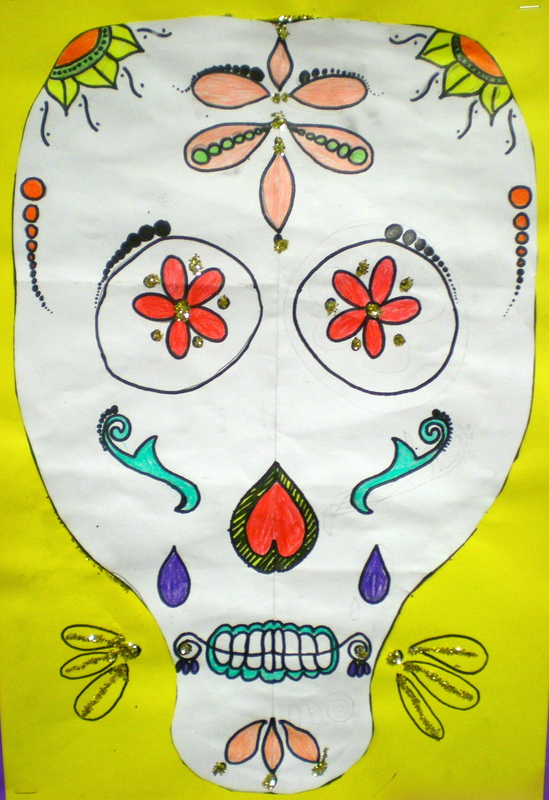 We practiced drawing sugar skulls using this website. 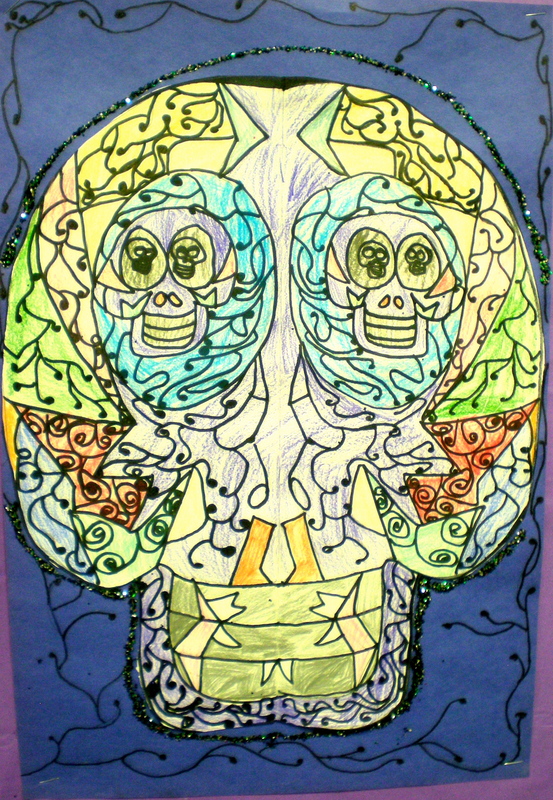 We created our 2-D, symmetrical designs by folding our skulls in half lengthwise, filling only one half of the skull, flipping over and tracing the other half with a light box (like those that display xrays – but are awesome for seeing through paper to trace!) to get a perfectly symmetrical design. 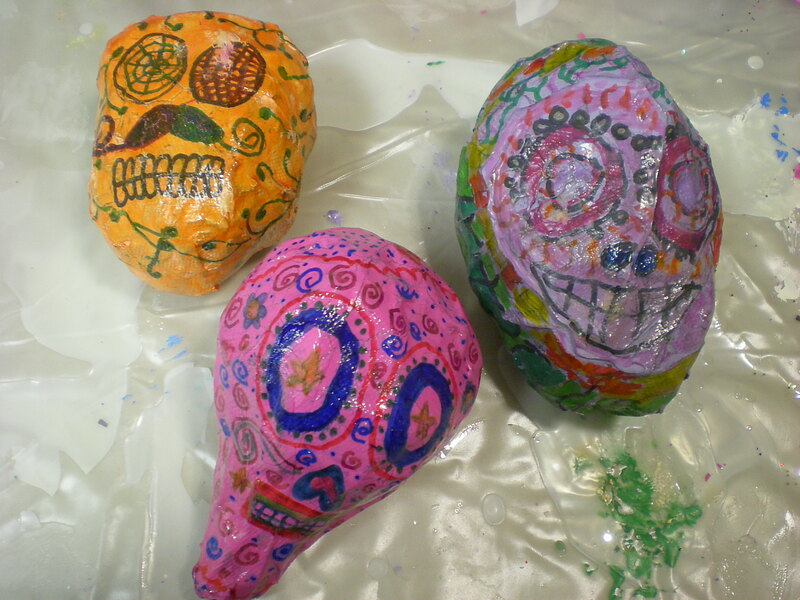 I understand the art and practices of Dia de los Muertos. 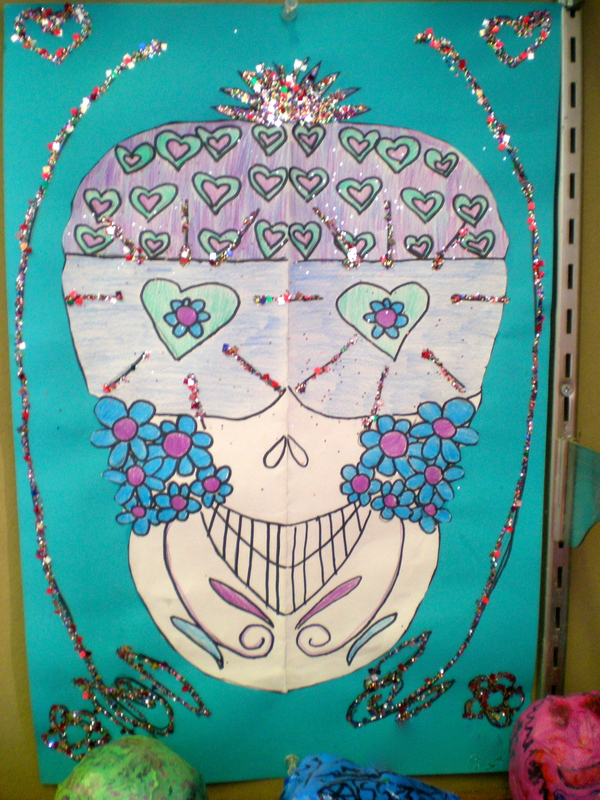 I understand that Sugar Skulls are made for Dia de los Muertos. 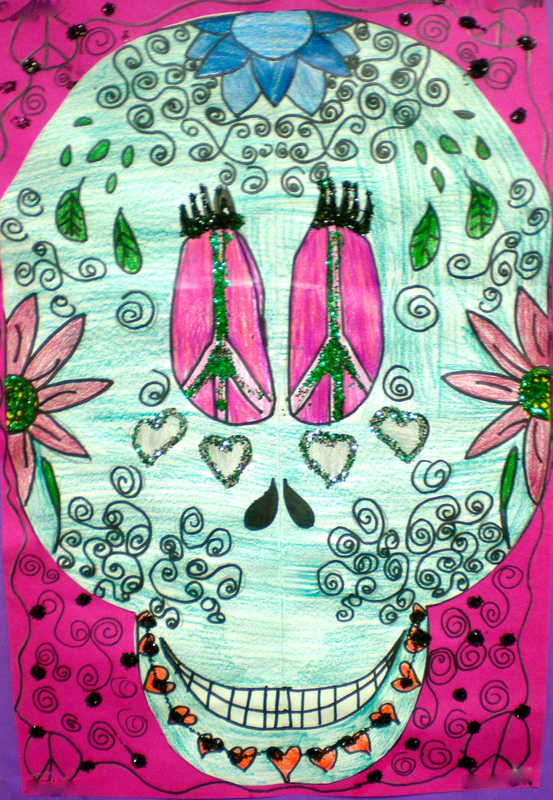 I can create my calavera using symmetrical design. I can explain the difference between 2-D shapes and 3-D forms. I can demonstrate my understanding of symmetrical and asymmetrical design. I feel it’s extremely important to study color theory at each grade level, whether it’s learning basic vocabulary, mixing colors, or both. 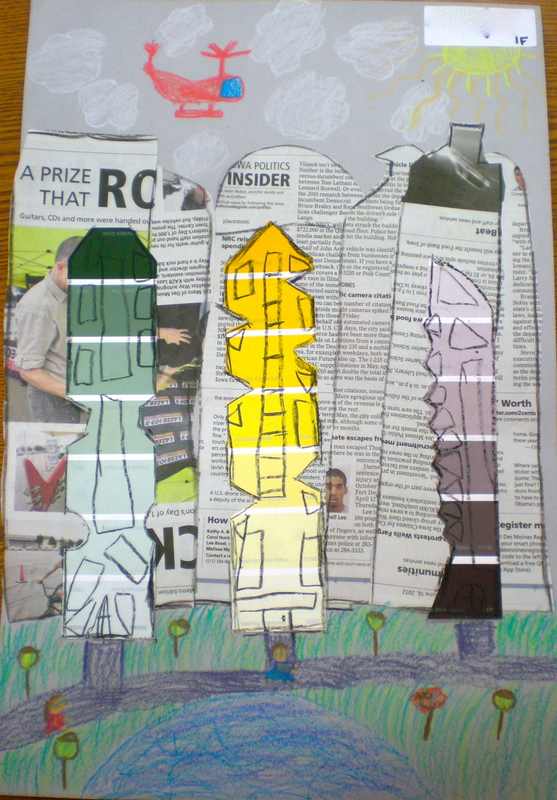 I found this idea for an abstracted color wheel in the monthly Arts and Activities magazine. In addition to the tints, shades, and primary and secondary colors we use in this project, we familiarized ourselves with additional color vocabulary: intermediate colors, neutral colors, warm colors, cool colors, analogous colors, complementary colors, and hue. 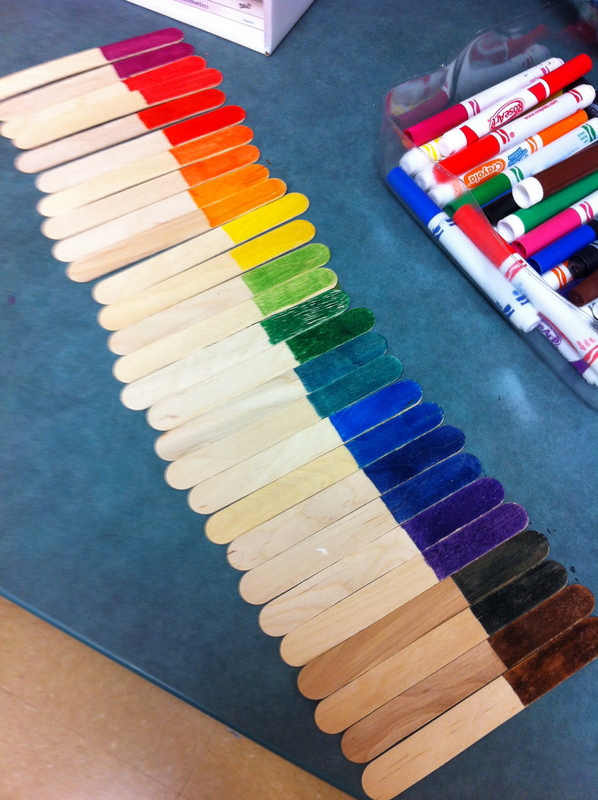 To get to know each color on the color wheel (and a few neutral colors) a little better we did this stick activity as a whole group then in partners. 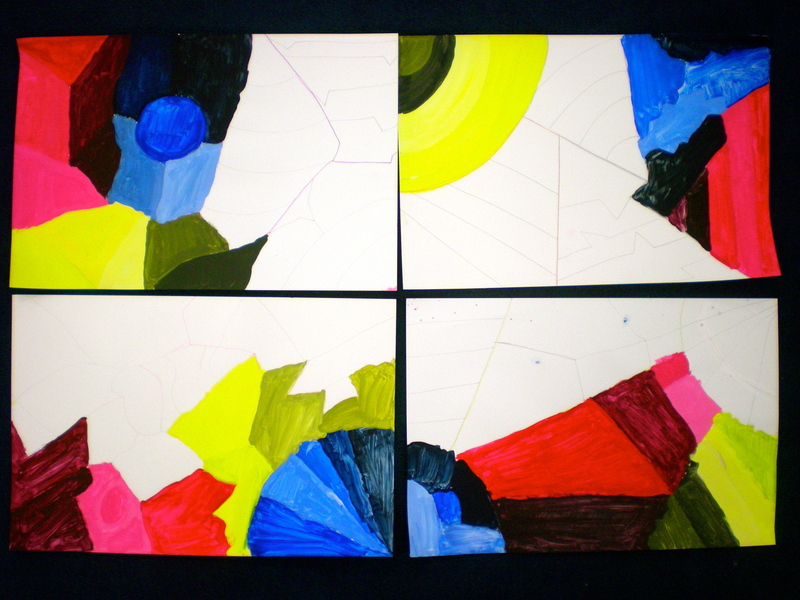 To create these abstracted color wheels students made 6 areas of roughly the same size on their whole page (we traced over the lines of these areas with colored pencil to eliminate confusion later), then within each area 5 sections were made. 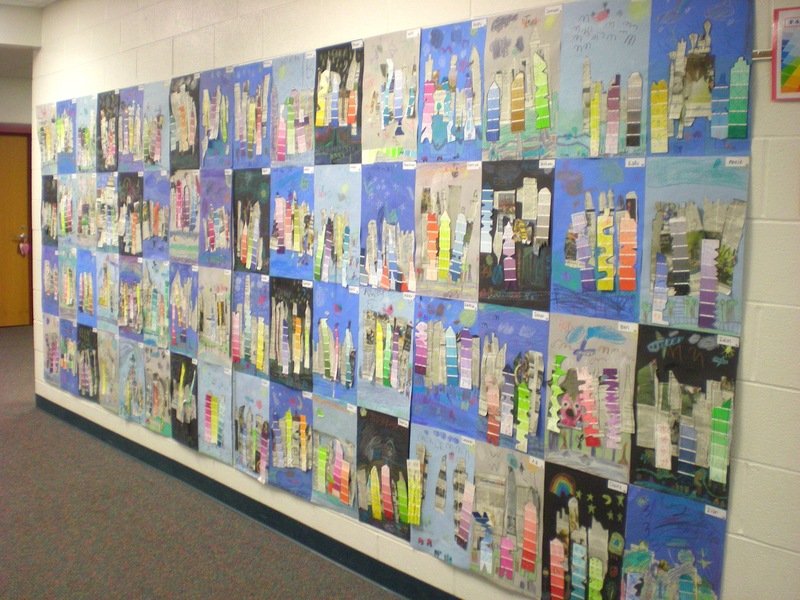 Each area would then feature a primary or secondary color and two of its tints and shades. 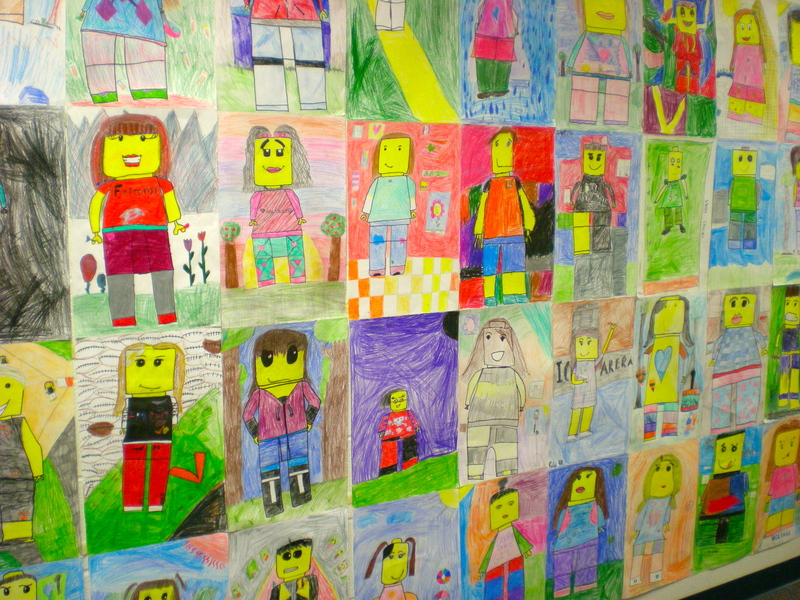 I understand the primary colors can be mixed to make almost all other colors. I can mix primary colors to make secondary colors. I can use white and black to mix tints and shades of colors. I can use color vocabulary. What a fun way to start off the year! A modern spin on a self-portrait. Fourth grade were my guinea pigs on this lesson – I saw the idea on a blog (and can’t remember it now!). 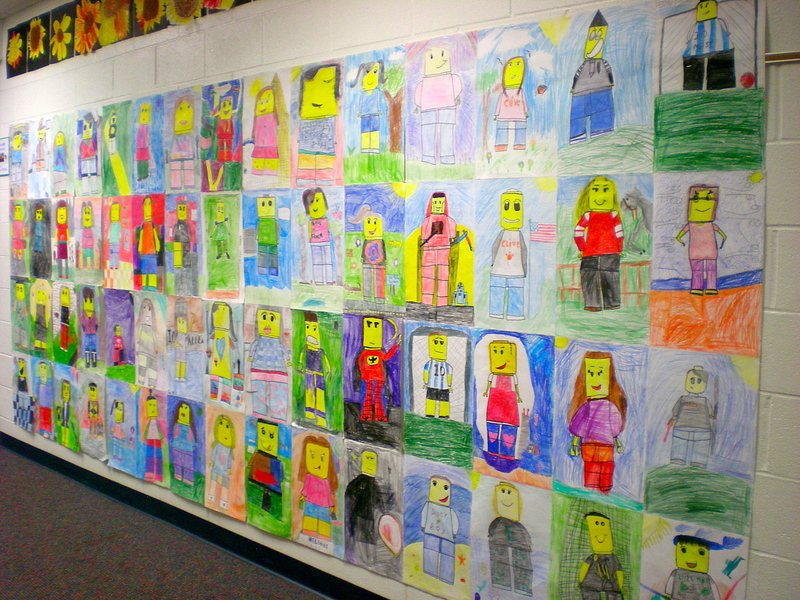 Legos have always been a favorite toy ever since their inception in 1949 in Denmark. Growing from basic colored bricks, there are now sets related to movies, cartoons, careers, cars, princesses, super heroes, architecture, etc., and entire amusement parks dedicated to these creative little bricks! 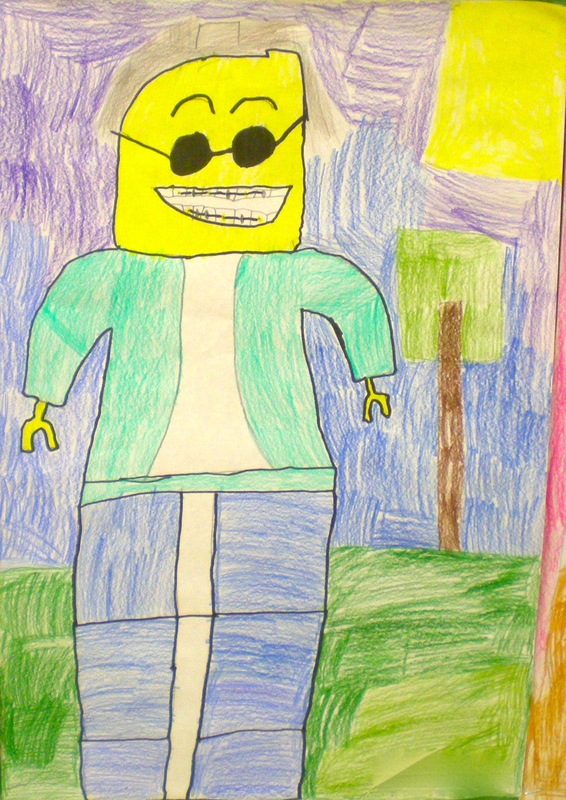 Though we explored basics of creating realistic faces, the fun part was adapting these features to that of the Lego Mini Figure with its geometric body, and cartoon-like facial expressions. I am very impressed and look forward to doing this in the future! I can follow the step-by-step process of face-mapping to draw and accurate and proportional face. 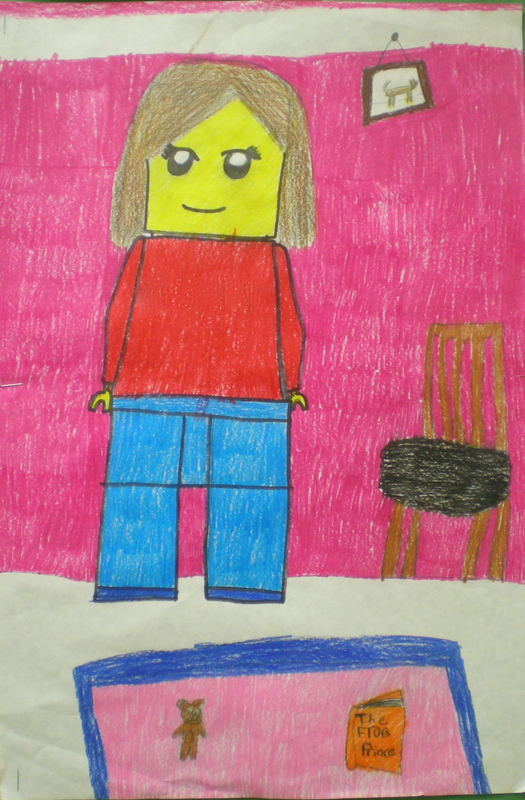 I can draw my Lego self-portrait using the figure and steps I was shown, and make it resemble my hair, clothing, and facial expression. 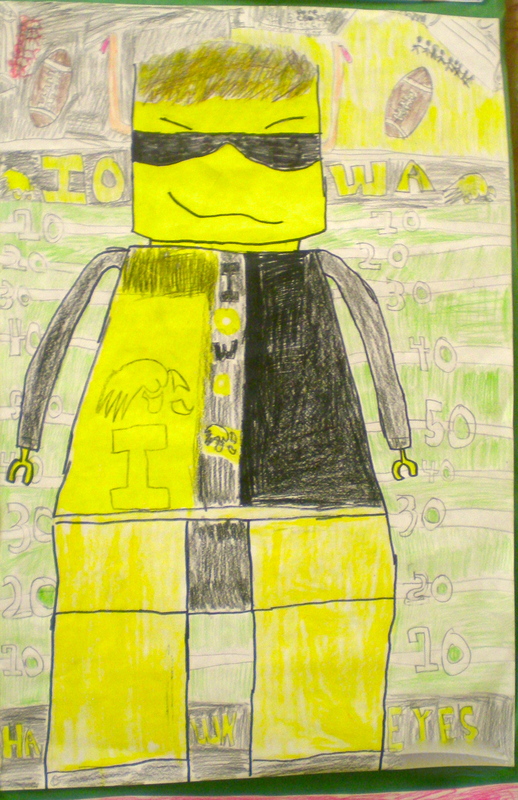 I can draw a Lego figure that looks like me, and fill it in smoothly and carefully with colored pencil. 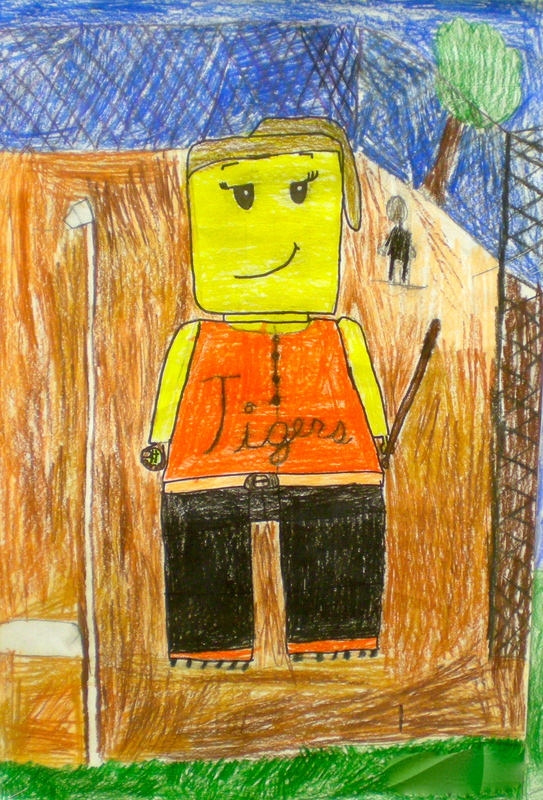 I can draw a neat background that fills the page and is related to my Lego-Me. 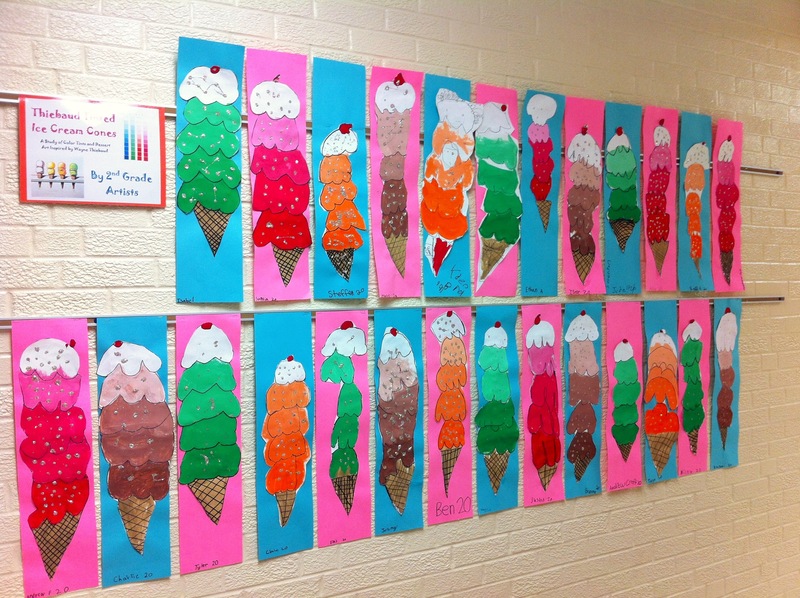 This project took a few more days than planned, but the results definitely speak to the student’s understanding of color theory and color mixing! Understanding color theory, color terms, and knowing what colors make others, is not only essential in the world of art, but other walks of life as well. Some great examples students came up with were those such as hair dressers, decorators, if you’re painting your house, if you’re painting a sports field, if you do fashion, if you’re designing logos, designing video games – and so many more – what can you come up with?! 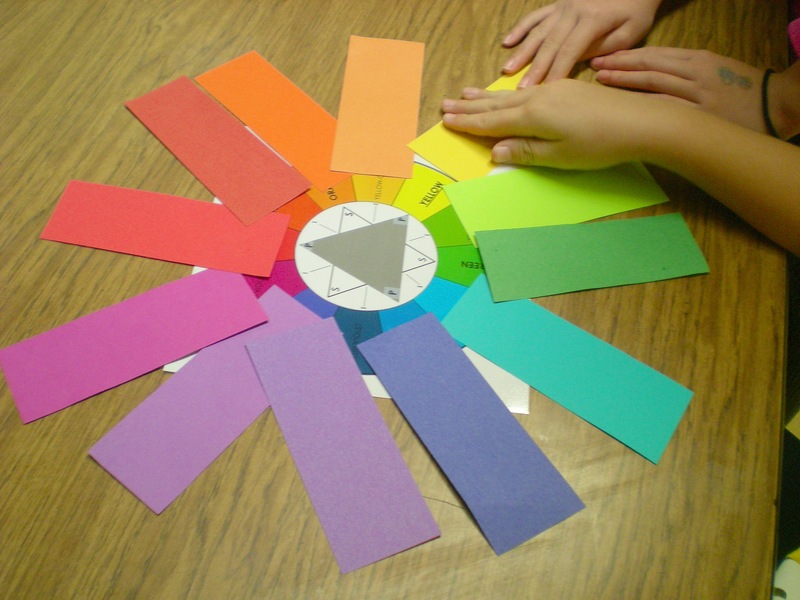 Our emphasis was truly upon familiarizing ourselves with color vocabulary and working the with colors of the color wheel, including the primary, secondary, and intermediate colors. Though it only covers the primary and secondary colors, one of my favorite videos to show (K-6) is this one by Ok Go, originally made for Sesame Street. 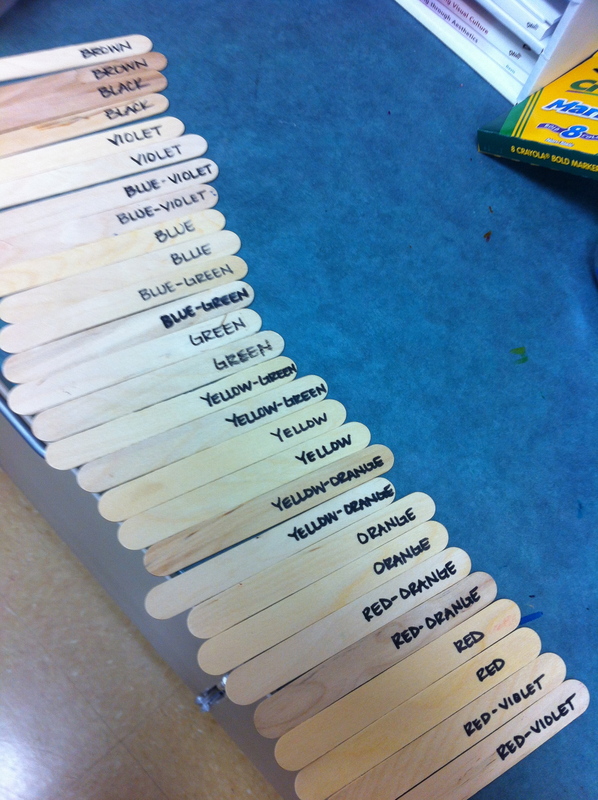 We also did this stick activity to identify colors as a whole group, then in partners. 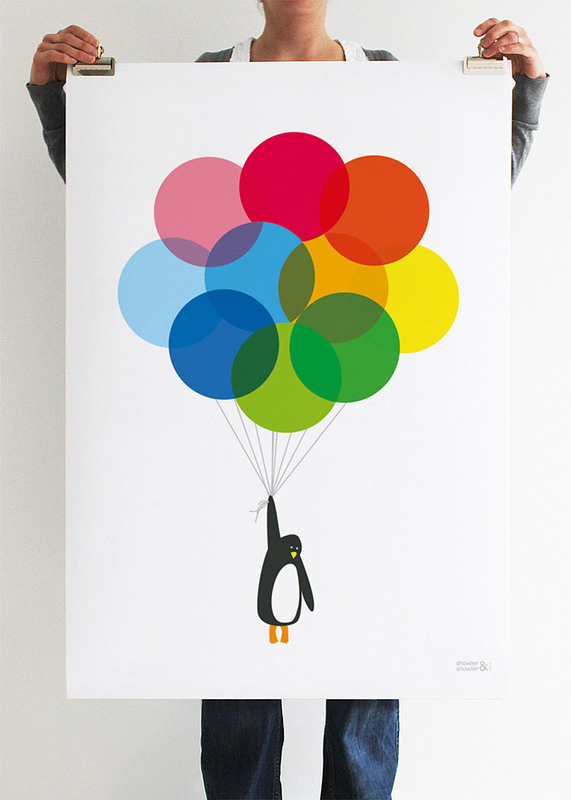 For the project we were inspired by the penguin image below and the movie Up, about a house being carried away buy a large bunch of balloons. 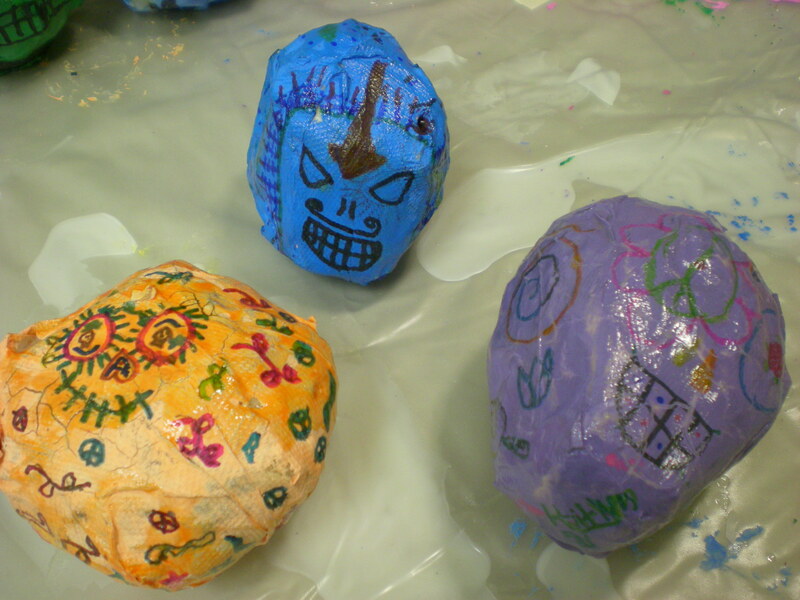 The kiddos were only given blue, red, and yellow, and were required to mix their own secondary and intermediate colors in the creation of their own balloon bunches. 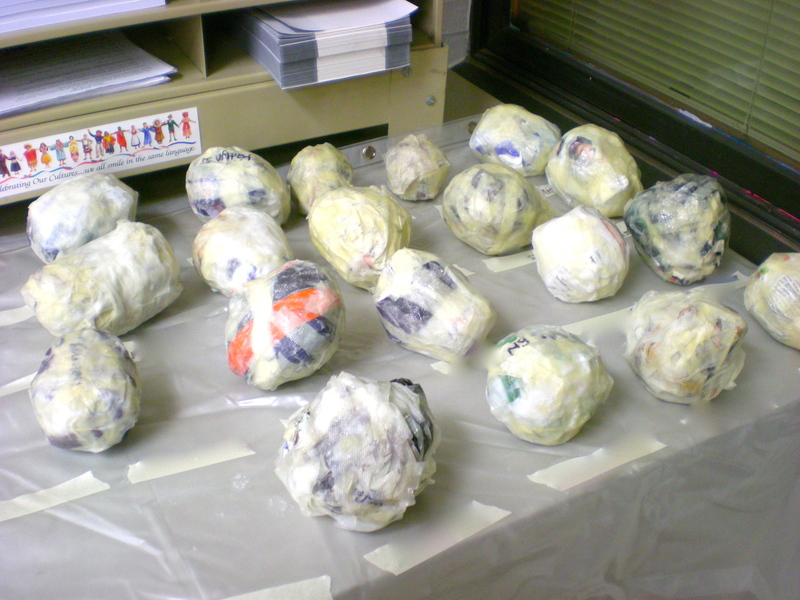 The bunches needed to contain seven balloons – 6 around 1 center balloon. The six balloons need to be the primary and secondary colors in the correct order of the color wheel. Where these balloons overlapped (like a Venn diagram), the appropriate intermediate color was painted. 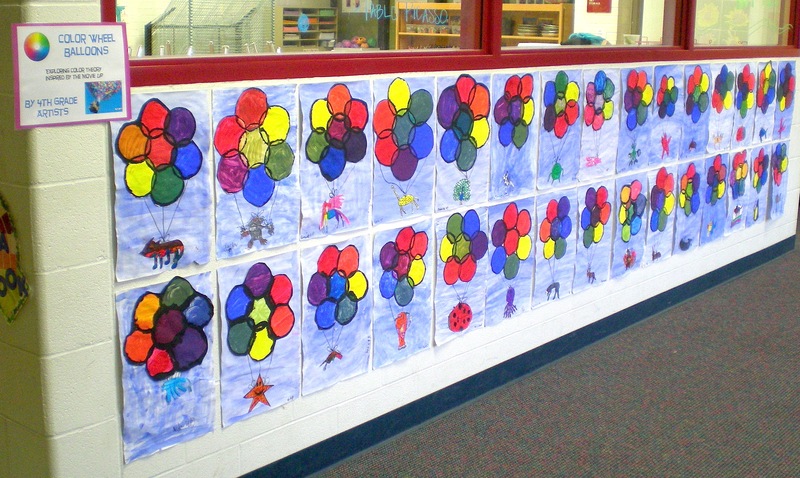 These balloons then represented the 12-color color wheel painted in the correct order. 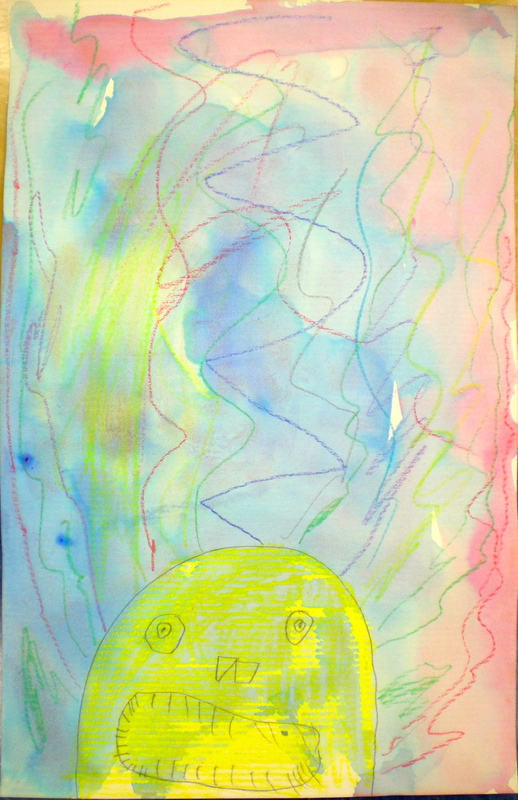 The center balloon could be an intermediate color of the student’s choice, and where that chosen intermediate color overlapped with the balloons surrounding it – the students mixed the result of those two colors as well. 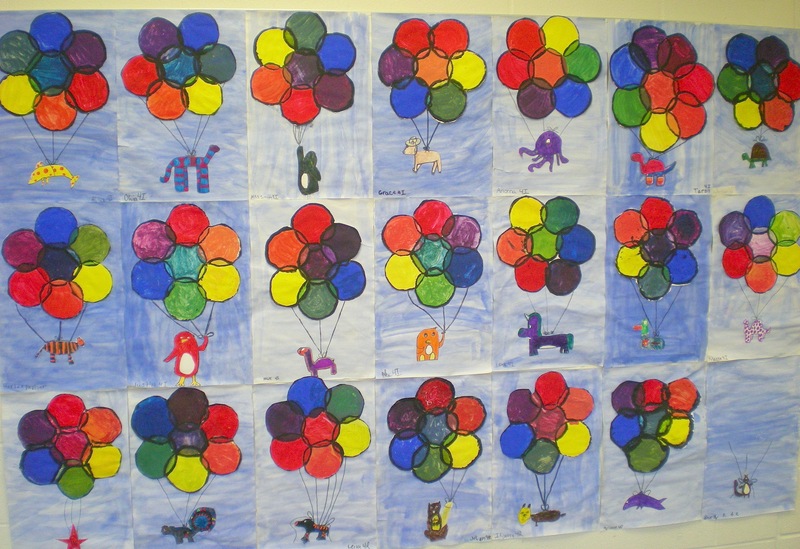 They were given freedom as to which animal (real or imaginary) their balloons would be carrying away – I think they turned out GREAT!! 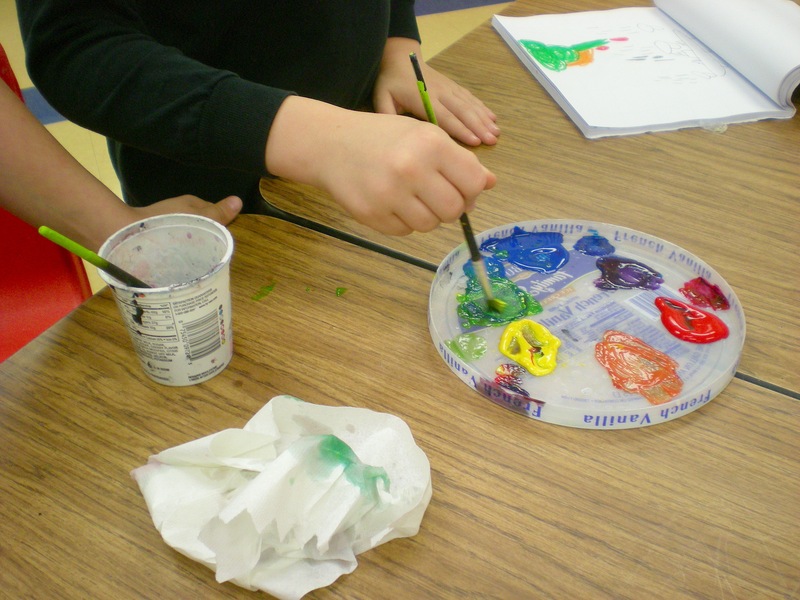 I can demonstrate my understanding of color mixing in class discussion, partner activities, and painting my balloons. I can use the correct terms and vocabulary when talking about color. Sticks for Color Activity mentioned above. Color identification partner practice and color mixing practice. 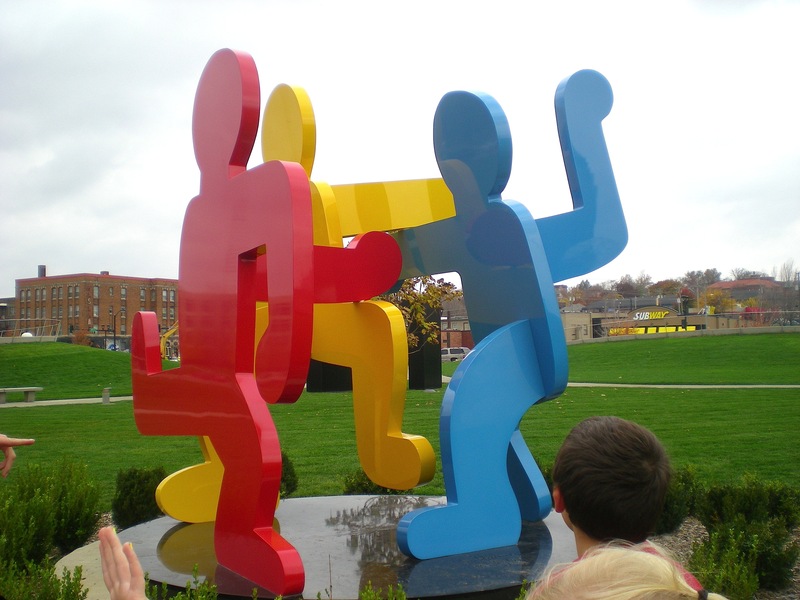 Taking inspiration from our field trip to the Pappajohn Sculpture Park in downtown Des Moines, we decided to create people frozen in motion in the artistic style of Keith Haring. After taking a closer look at some of Keith Haring’s images and his unique way of creating the cartoon figure of a human, we took turns posing and sketching only the outline of the person in action. To make the actions and movements more realistic for our final image we incorporated the wooden mannequin – a drawing tool. We go through a drawing process of a person with semi-complex details, to a simplified silhouette (outlined shadow or shape) of a person. The mannequin helps artists to draw humans in an accurate and proportional way because the ‘joints’ can move in the way a human’s does. To begin the drawing, it is easiest to draw each wooden piece as you see it in front of you, then once that is done, outline the basic shape to achieve the first outline shape, and then alter the outline to your preferences to achieve the final shape of the silhouetted person in motion. Because some of Haring’s images are so simplified, using only two colors in some images, I thought this would be a great way to introduce the idea of positive and negative space. We took a closer look at something that would be positive in an image (the first thing your eye sees, the main object), and the negative space of an image (the space around, behind, or between the main object), then explored positive and negative space with the Seeing Outside the Box cards, as well as the clever silhouette advertising of Apple products. 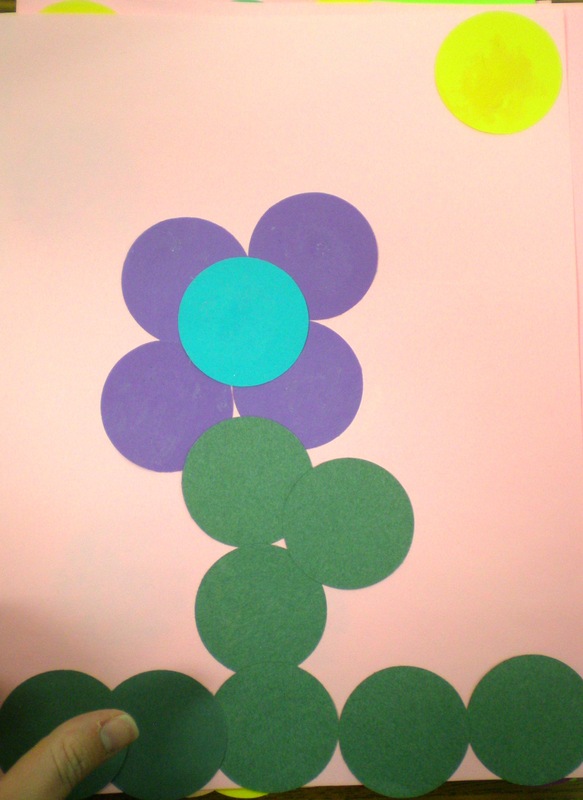 To refresh our memories about silhouettes and positive and negative space we studied more Seeing Outside the Box cards, and read the book Mother, Mother I Feel Sick… by Remy Charlip. 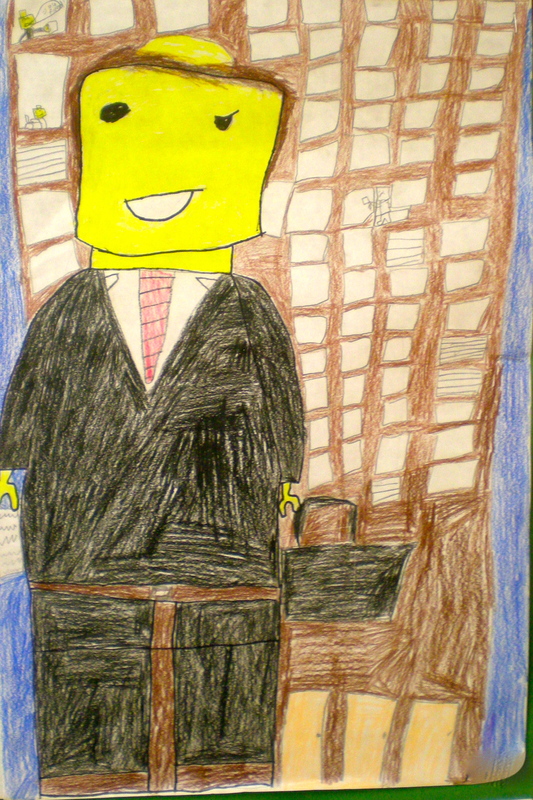 I can draw a human figure in the cartoon style of Keith Haring. 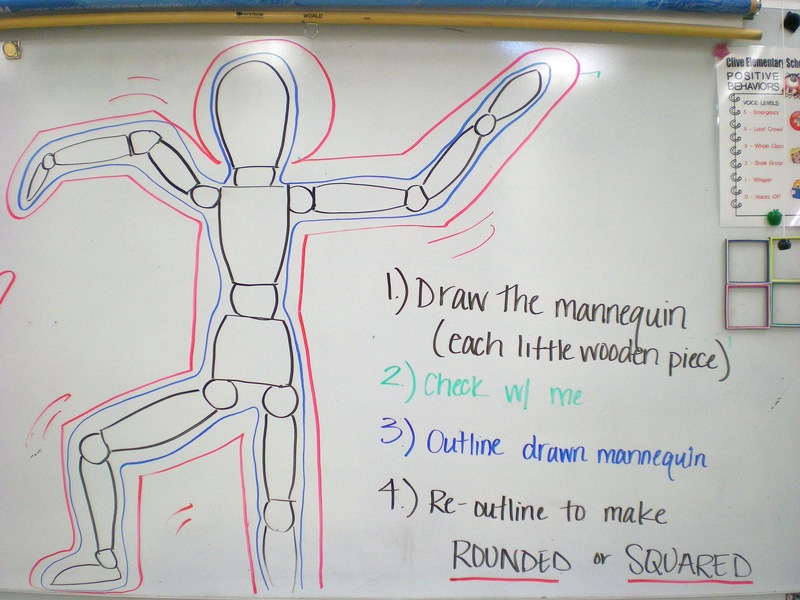 I can use the wooden drawing mannequin to draw the first stage of my person in motion. I understand the difference between positive and negative shape and space. Here is a quick look at our process – final project pictures to come! 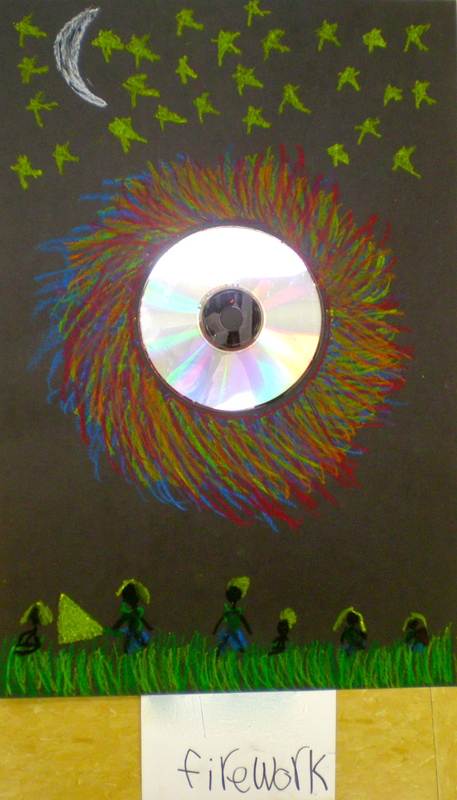 I can use my imagination and creativity to turn my CD into a NOT-A-CD. 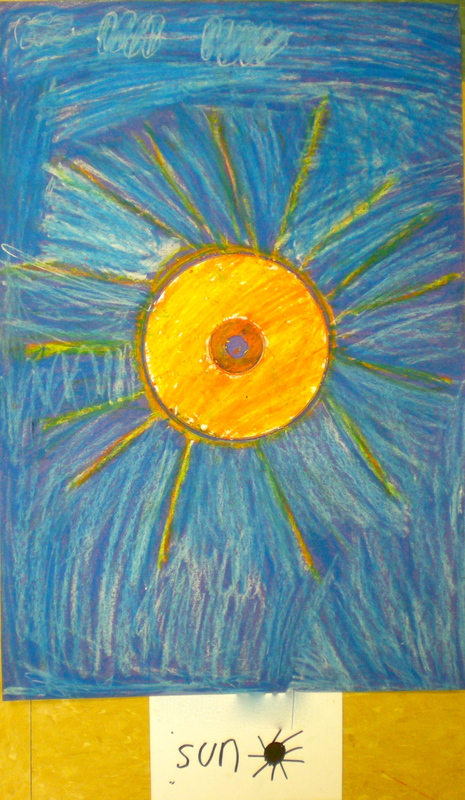 I can fill my whole page with my neat, colorful drawing using oil pastels. 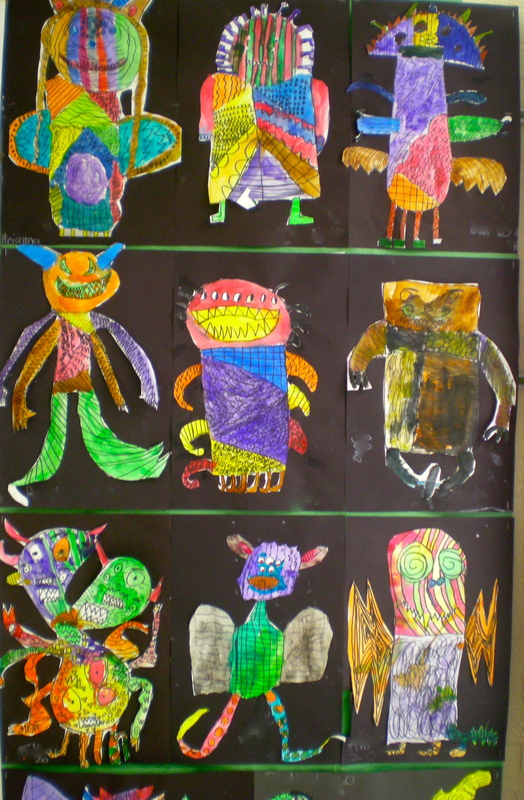 These two versions of our monsters were a joint exploration of the elements of line, pattern, and texture. 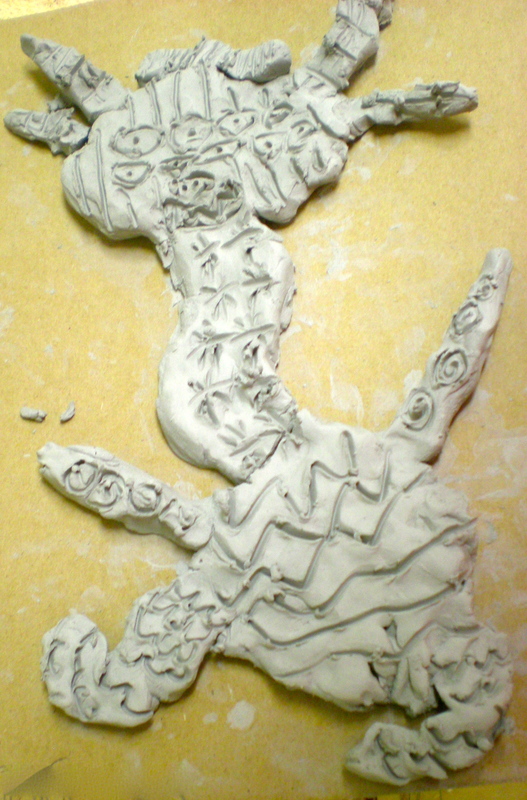 Our ultimate conclusion was that if we created lines in a pattern, we would create the illusion of texture for our two-dimensional (flat, drawn) monsters, and when lines were made into patterns in clay we created a texture we could actually feel. 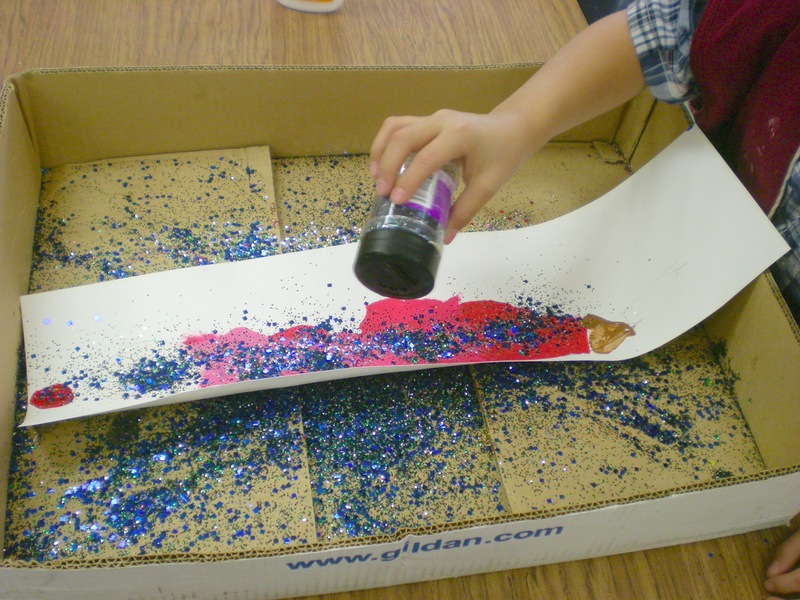 To begin our exploration of texture with 3 of our 5 senses (not tasting or smelling :)), we IDENTIFIED and felt textures around the art room, like the bottom of our shoes, the chairs versus the tile versus the carpet, and then created texture rubbings using peeled crayons and paper to SEE the different textures that would result when placing paper over the object and pressing the crayon back and forth across the paper. For our second exercise, we LISTENED to and then drew the detailed descriptions written in the story of the Island of Hullaballoo. 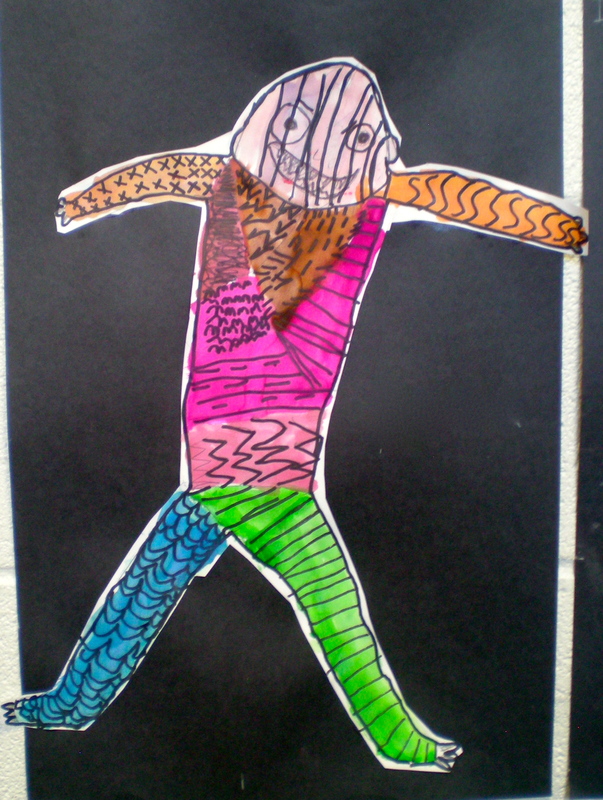 These descriptions included animals and landforms of different patterns, lines, and textures. 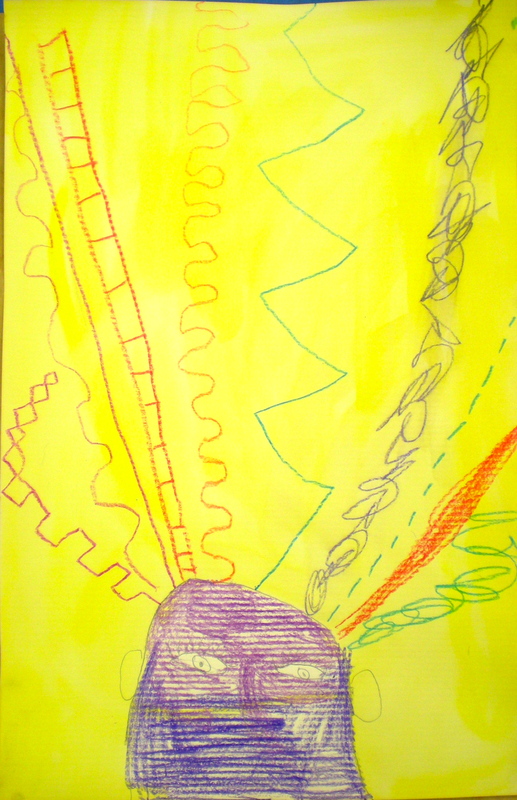 Each drawing has completely different results as the kiddos only have their hearing, memory, and imagination to create this fictional island. Our next exercise was to reach into mystery bags to FEEL and identify the textures hidden inside. (This was an old hidden gem I found while cleaning and organizing this summer!) 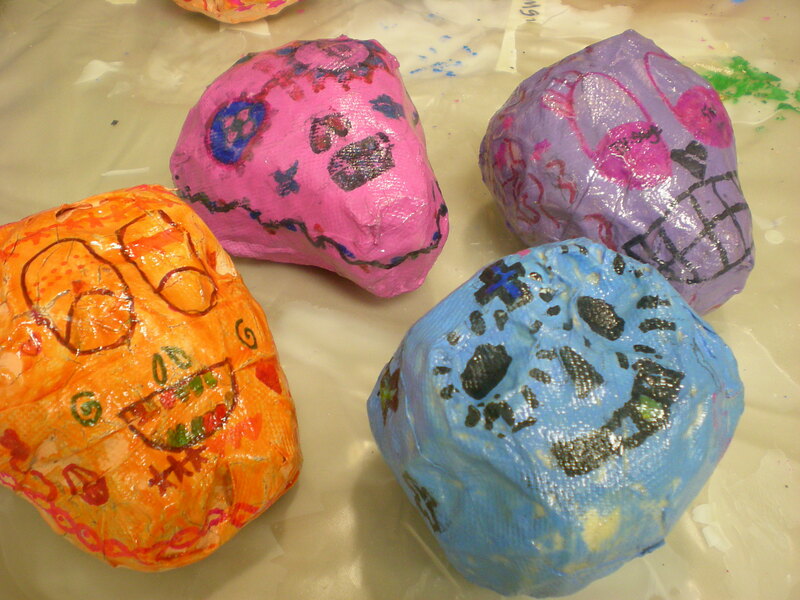 The idea is that there are 8 to 9 different colors of bags, each colored bag contains a different swatch of texture, the kiddos pass it around, and then sketch the texture they feel. 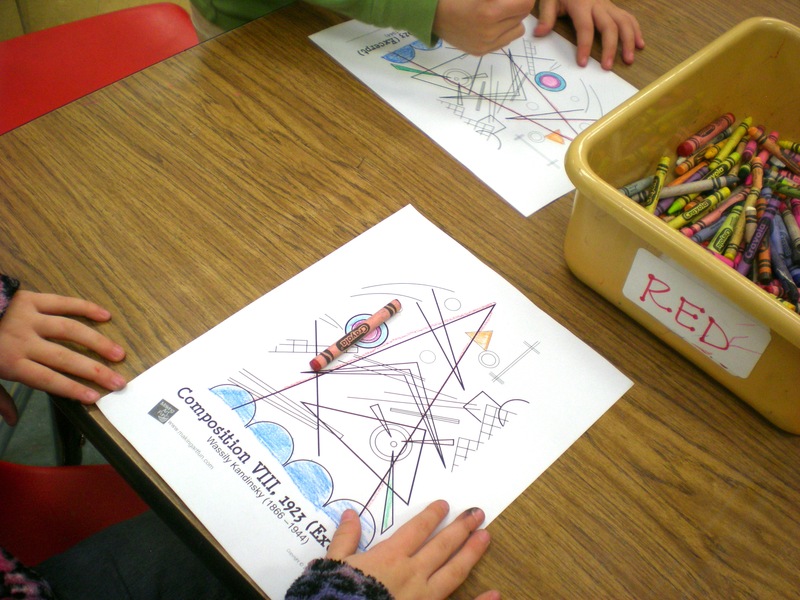 After having done this exercise 3 to 4 times with different textures, we compare their drawings with photos provided in the game to see if their guesses and drawings were accurate. 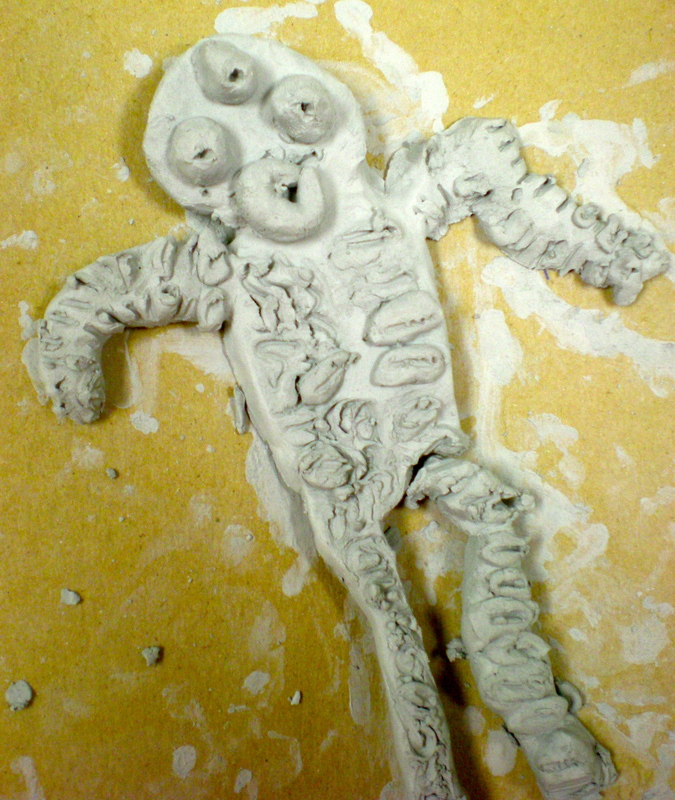 We tried to make the clay monsters and the drawn monsters as similar as possible in order to see the transformation of texture from paper to clay. 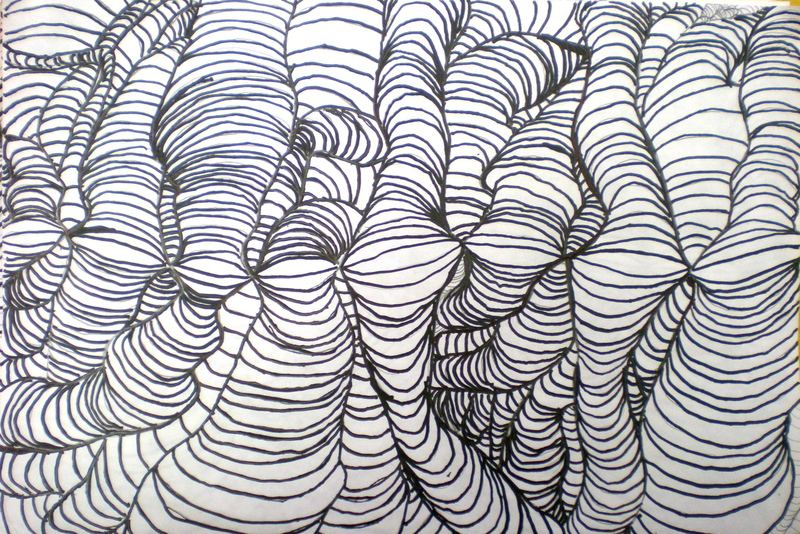 I can feel and draw different kinds of textures. 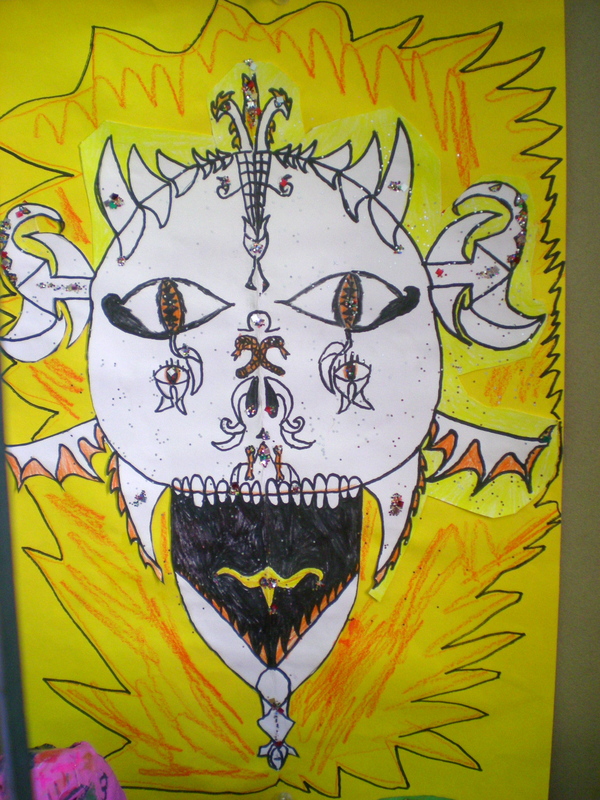 I can draw different patterns and textures to create my monster. 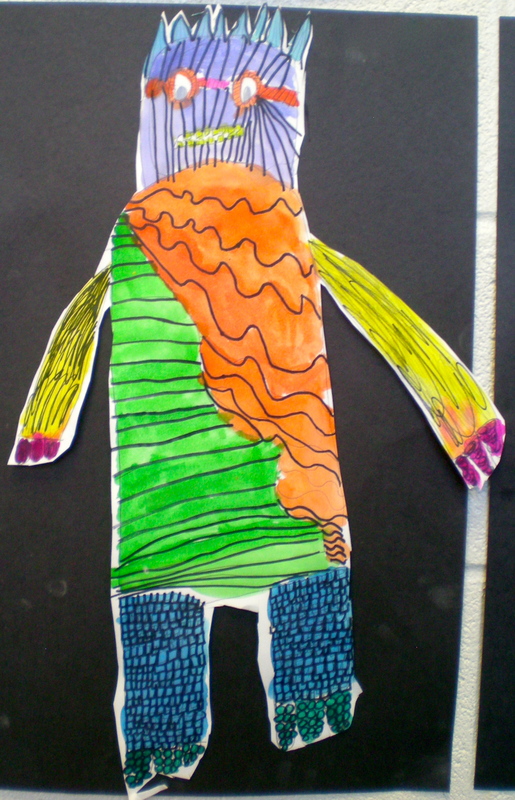 I can use different materials, patterns, and textures to create my monster. 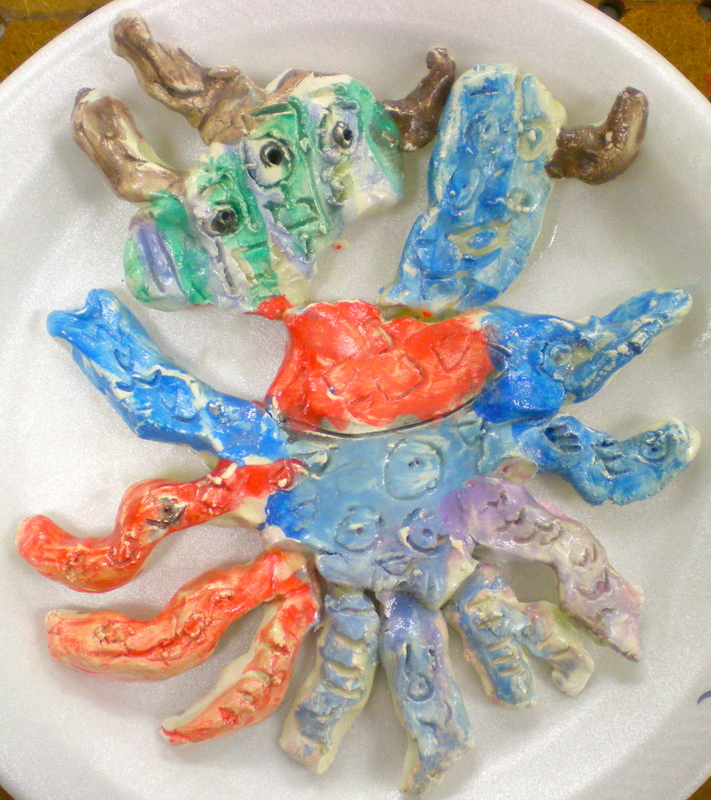 I can communicate texture through line, pattern, and clay techniques. 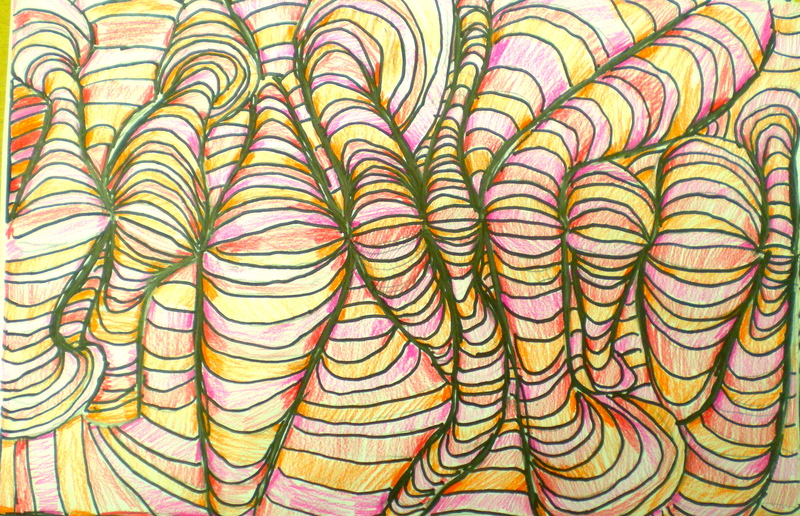 For the first part of our four part self-portrait series, we explored drawing using contour line. These great videos introduced us to the challenges of drawing blind contour portraits (when you can’t look at your paper while you’re drawing) and continuous contour portraits (you must draw the entirety of a face without lifting your pencil). The challenges resulted in some hilarious faces. 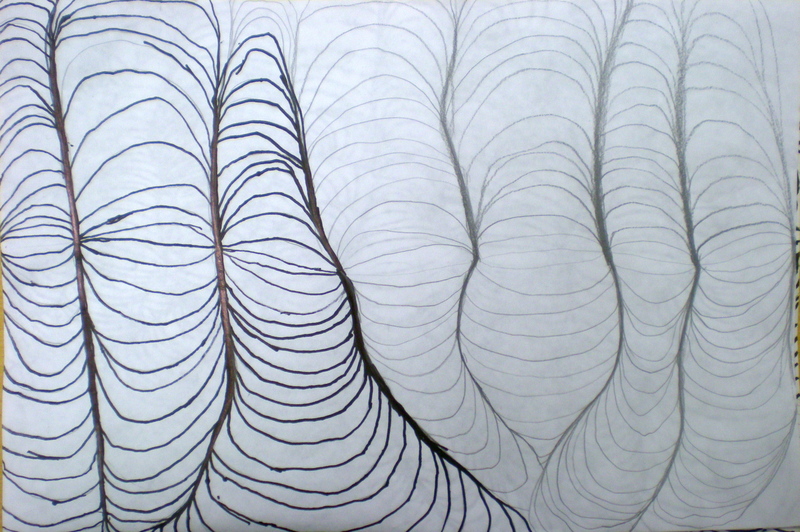 We were inspired by Pablo Picasso’s contour drawings, but in the future I would consider introducing Alexander Calder because of his amazing wire contour work. Home challenge: explore blind and continuous contour drawing of your family member’s faces!! I can use contour drawing techniques to create a face. Don’t they look good enough to eat! I can mix tints of a color. I understand Wayne Thiebaud painted desserts during the era of Pop Art. 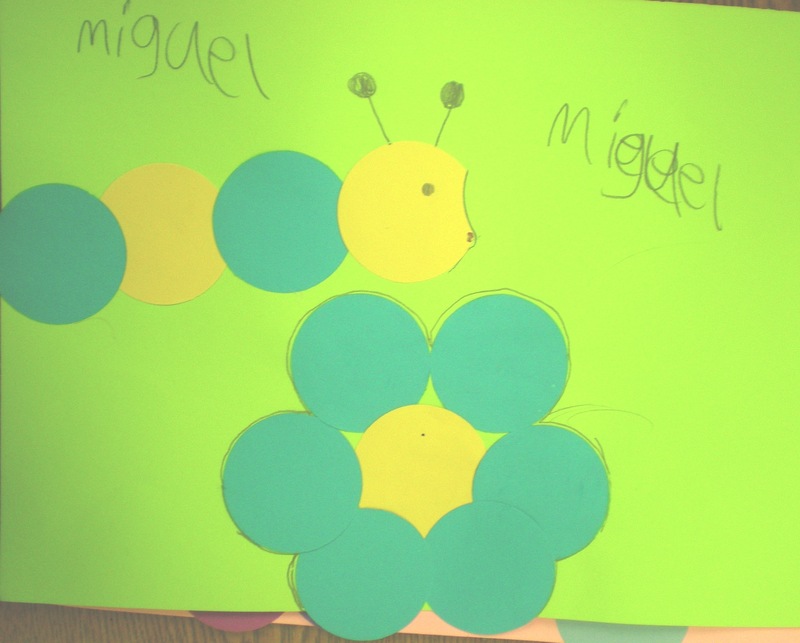 Our first Kindergarten (I only have one section of them) and 1st grade project concentrated on noticing and creating different kinds of lines, one of the Elements of Design. 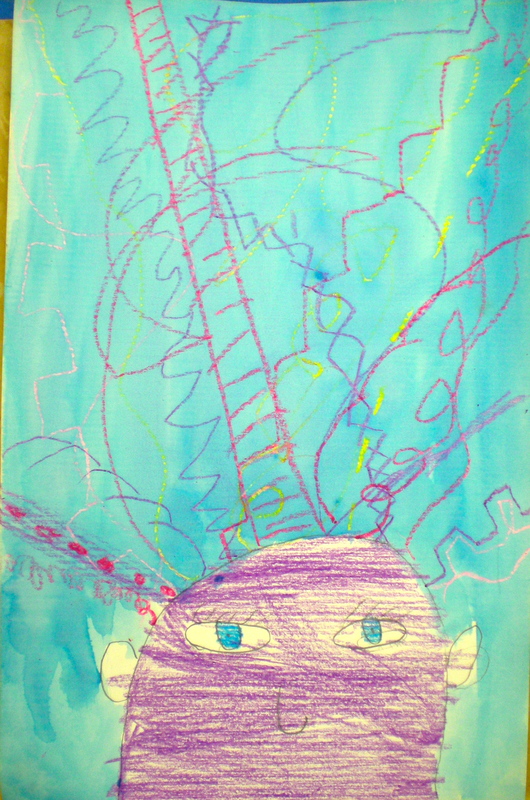 We read the book Lines That Wiggle by Candace Whitman to inspire our creation of Crazy Hair Heads and make treasure maps using different kinds of lines. 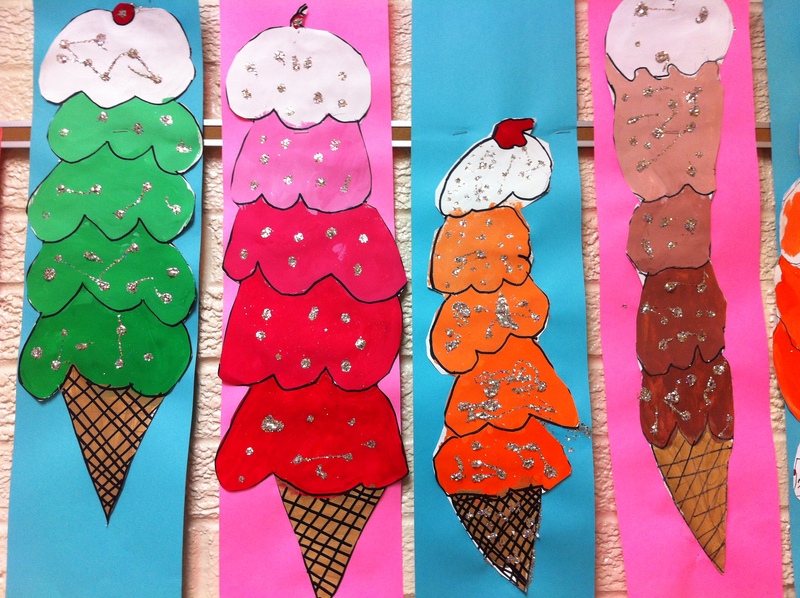 These turned out quite cute and opened up discussion about noticing some of the elements of design in the world around us like line, shape, color, value, form, texture, and space. 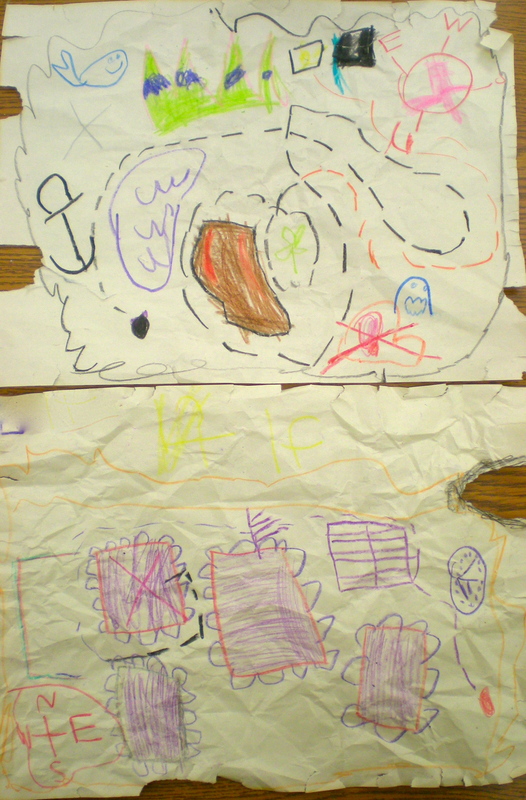 To inspire our treasure maps we read Pirates Don’t Change Diapers by David Shannon. We also discussed using symbols as a form of communication, especially on maps and signs. I can draw a variety of lines for my crazy hair. 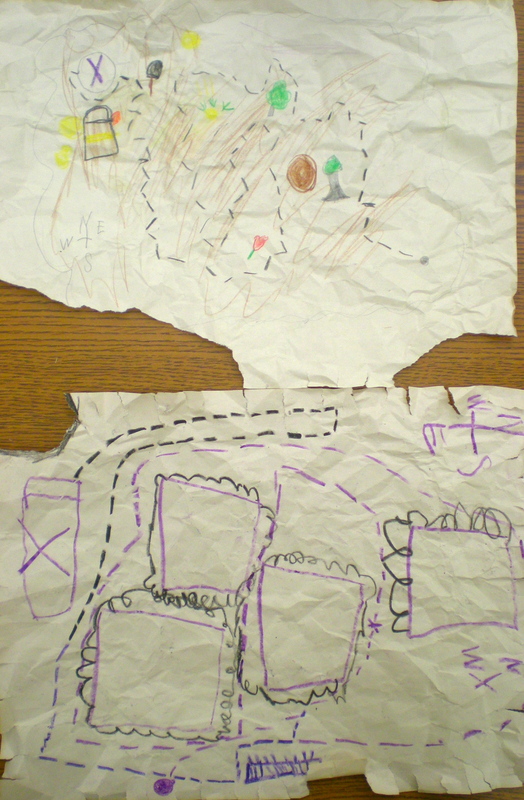 I can draw a variety of lines for my treasure map. 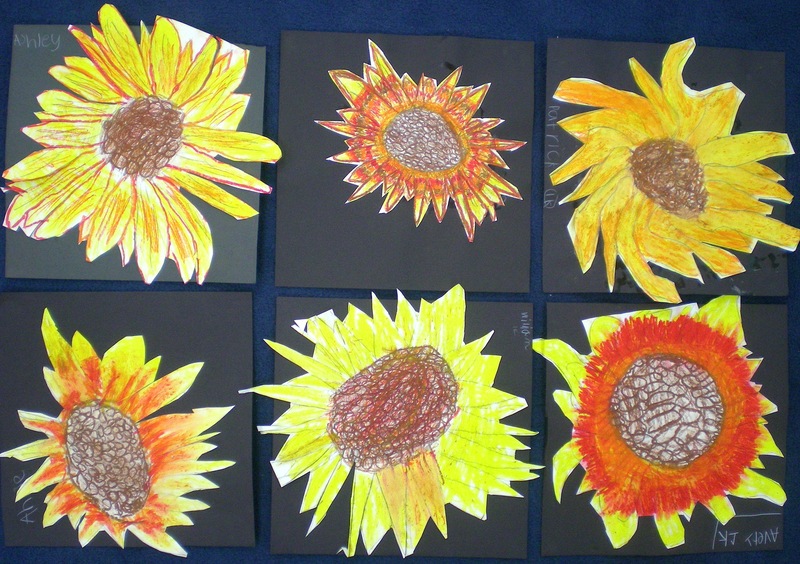 I can tell you what a still life is, show you how to draw a sunflower, and use warm colors. 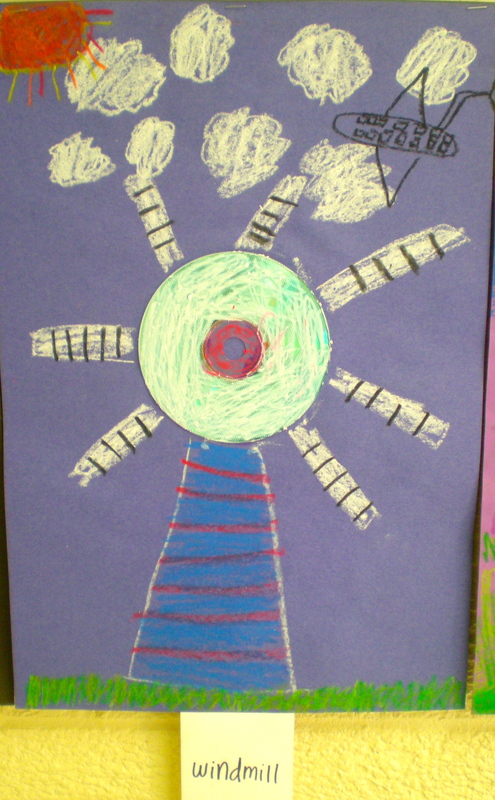 I can use oil pastels and oil pastel techniques to create my sunflower. 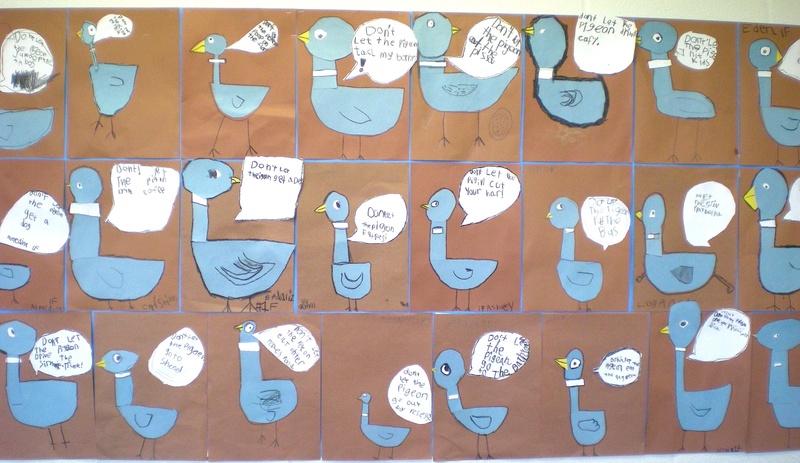 I can use shapes to construct a pigeon with scissors, paper, and glue. This year I decided to put a new twist on my paint card cities!! 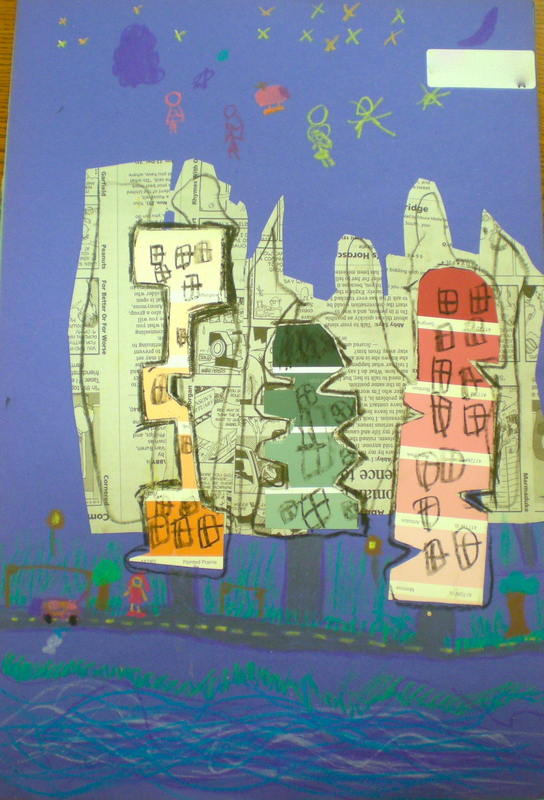 We added and emphasized background buildings using newspaper shapes versus simply drawing them. 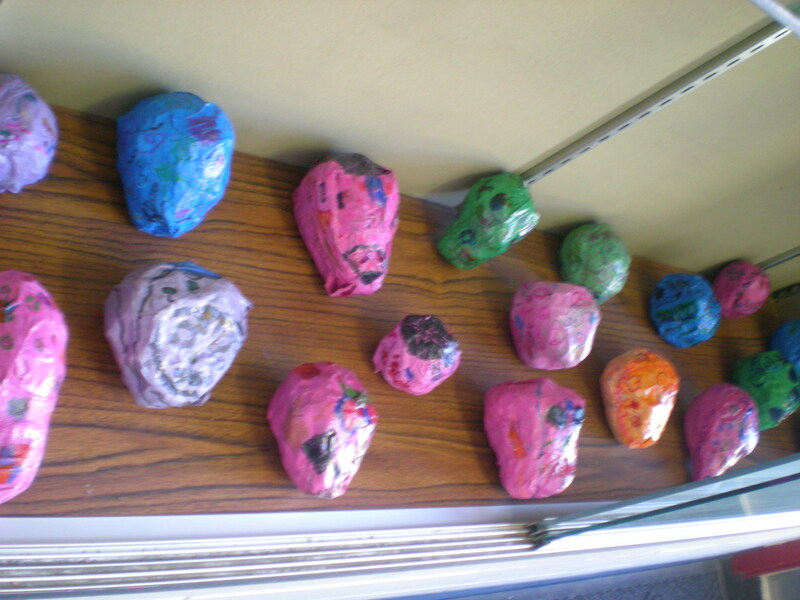 I was so happy to stumble upon this idea a year ago, because I think the idea of using unconventional objects in a project helps students to begin to see new uses and ideas for everyday objects – leading to the concepts of reusing and recycling. 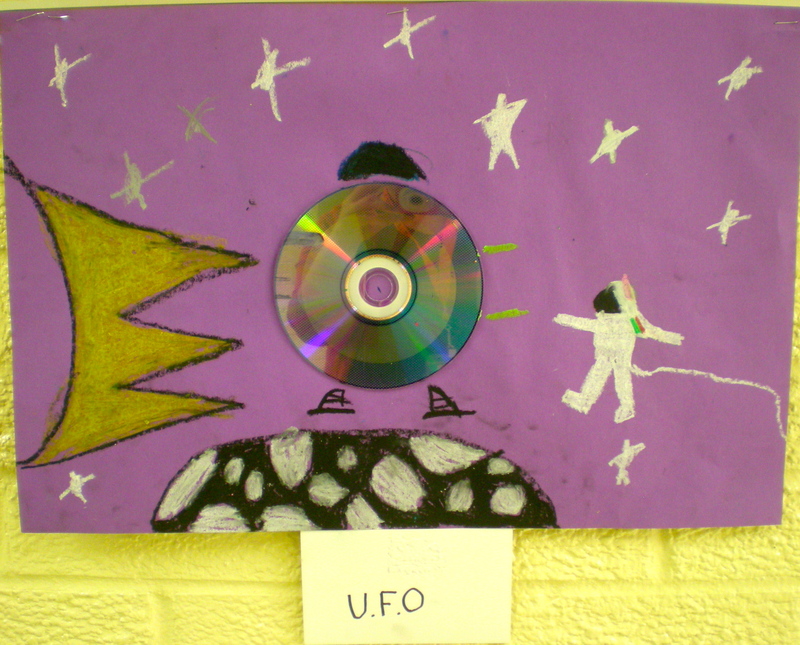 A lot of art that is being produced now uses these everyday objects in new ways – CD’s, records, food, school supplies, kitchen utensils, etc. – showing a whole new side to thinking critically and problem solving. Reading the book Iggy Peck Architect by Andrea Beaty allowed us to explore the profession of architecture, and led us to the conclusion that just as you can use shapes to construct animals (Pigeon Lesson), architects [and ourselves] can design and construct buildings out of shapes too. 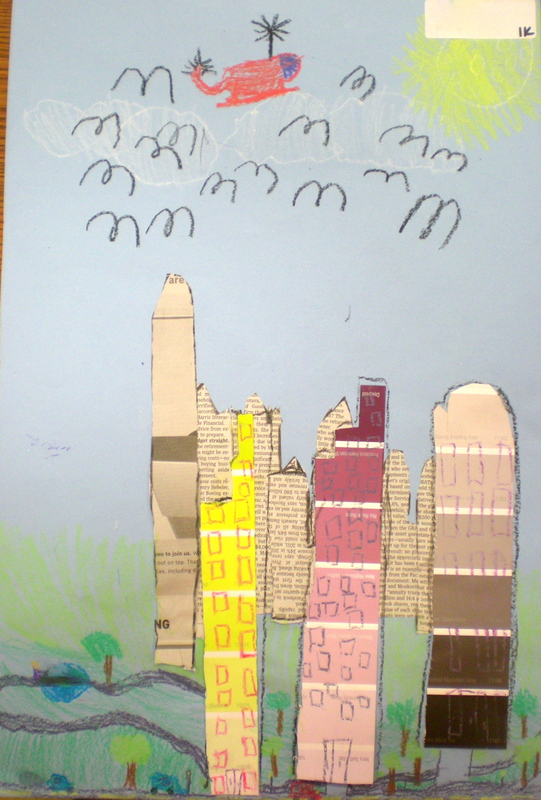 We carefully observed many pictures of cities to identify what buildings were in the background (far away, smaller, and less detail) and those that were in the middle ground/foreground (up closer, larger, brighter, and detailed). In addition to the concept of a background and foreground, we concentrated on the size and proportion of items you would see in a city (i.e. a person or tree would not be as tall as a sky scraper). Click here to see previous Paint Card City lessons. I can use shapes to construct buildings like architects do. I understand that buildings close to me are big. I understand that buildings farther away are smaller, and might be partly covered by buildings that are closer to me. 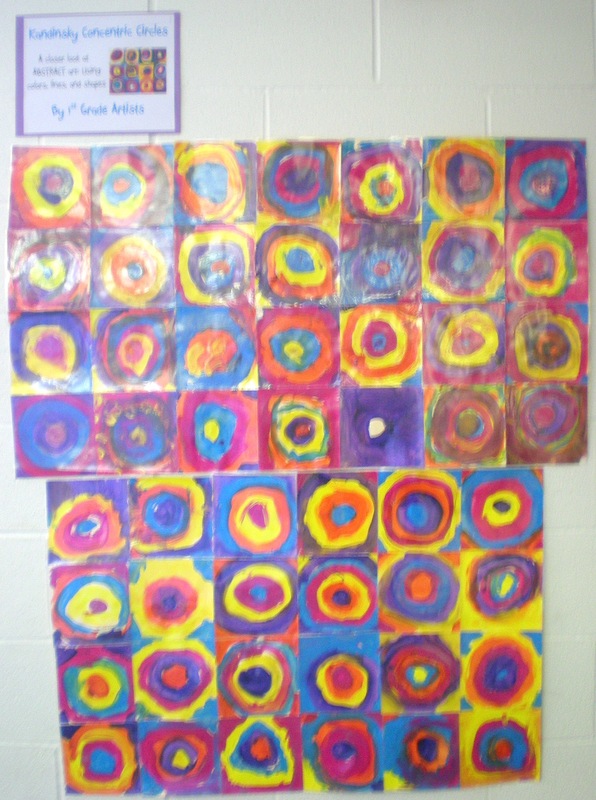 Though International Dot Day had passed, creating the Kandinsky Concentric Circles is one of my favorite 1st grade projects to do (and it’s fun to hear them repeat the mouthful of a title J). 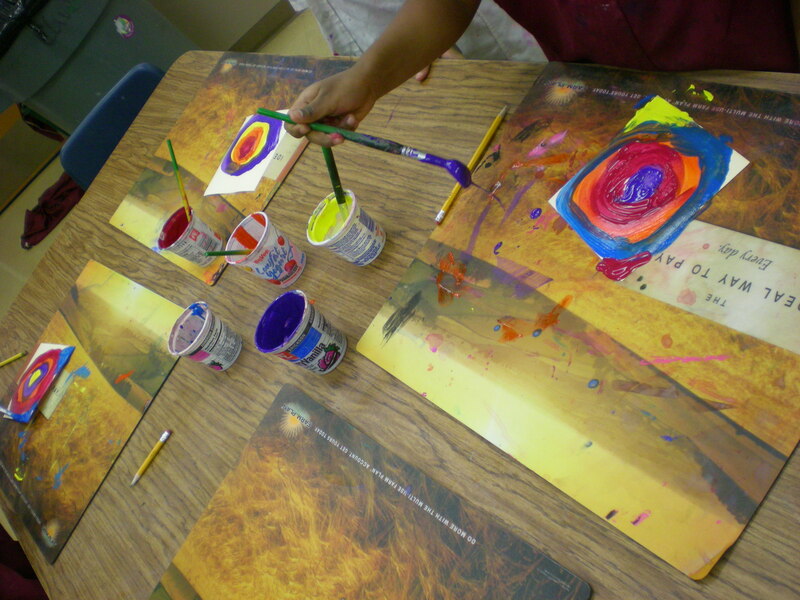 We learn about Wassily Kandinsky, and his major influence for bringing attention to abstract art. 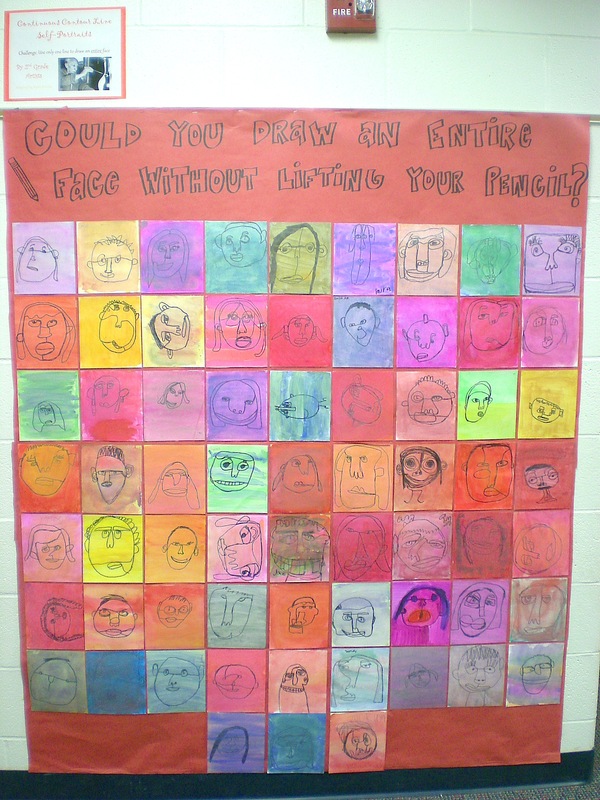 I discuss with the kiddos that abstract art is not of something like a person, place, or thing but can simply be a work using colors, line, and shape. We go through a powerpoint showing thumbs up or down if the paintings and art displayed are abstract or not – because this is a higher concept, I stick to the idea that abstract means color, line, and shape. Emphasis is also placed on brush control in the concentric circle creation process, but also identifying circles and spheres in the world around us. 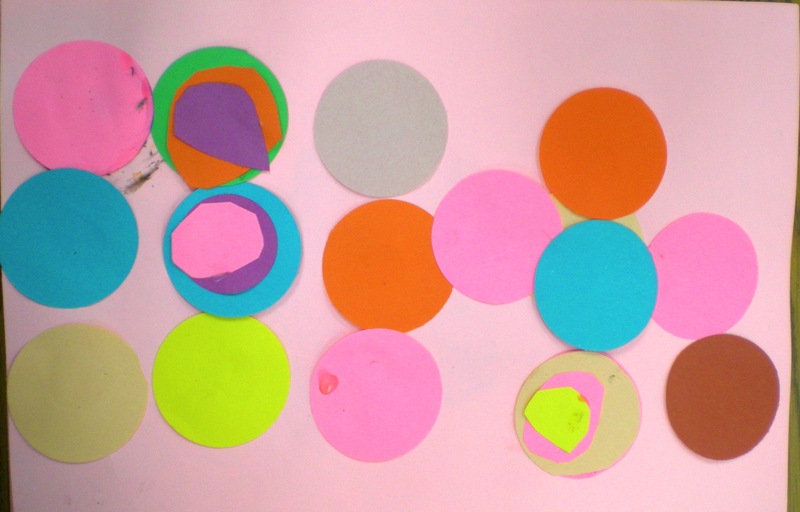 In addition to reading The Dot by Peter Reynolds, we read Lots of Dots by Craig Frazier who discusses seeing dots in everyday life – “dots from trees” = oranges, “dots to eat” = ice cream/grapes/eggs, “dots that are big, dots that are small”, etc. 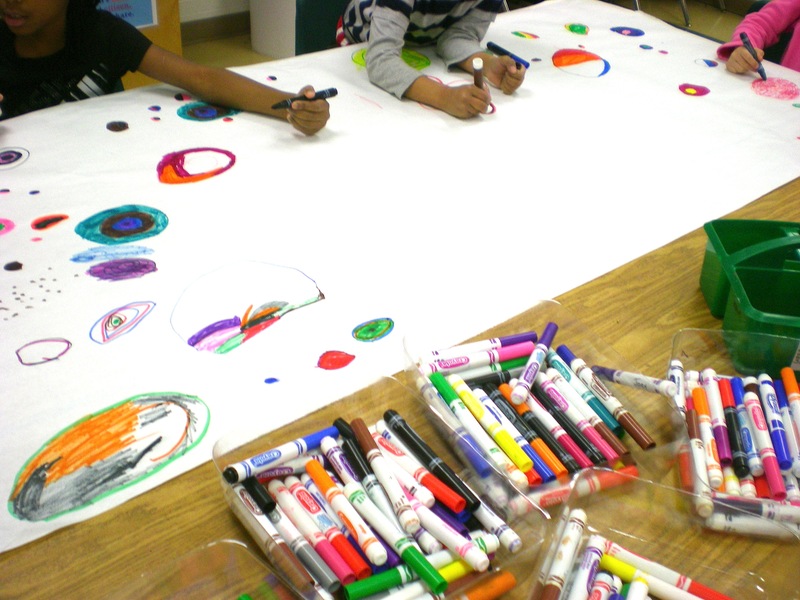 I do this project in centers in order to have a small group paint with me while other groups pursue dot and circle related activities. I am still in search of at least one or two other relevant and purposeful stations as I’ve tried a couple and feel I can create some that have more learning and creating involved, but am happy with the station inspired by Lots of Dots, and of course when we paint the concentric circles. 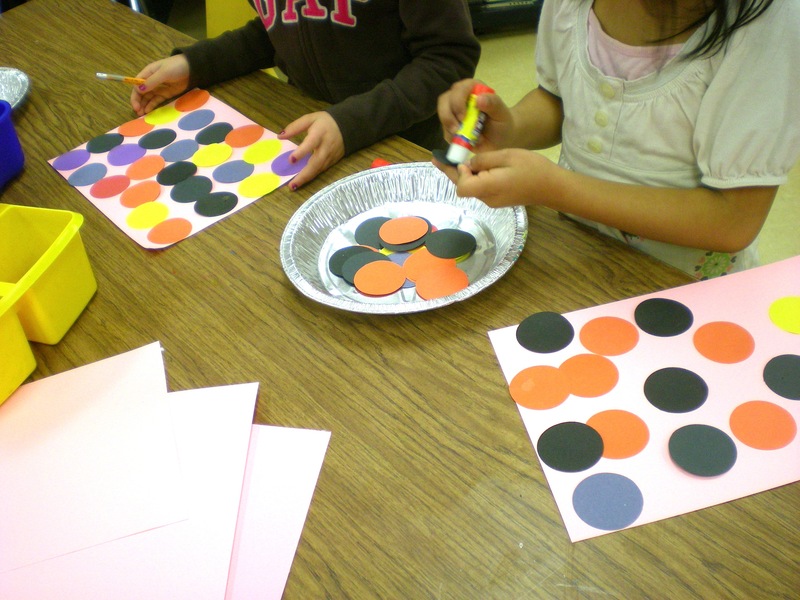 The lots-of-dots station has the students manipulate lots of hole-punched one-inch dots, scissors, and glue and have the freedom to glue down and create something new with these dots. See some of my older Kandinsky lessons here. I can identify circles and dots in the world around me. 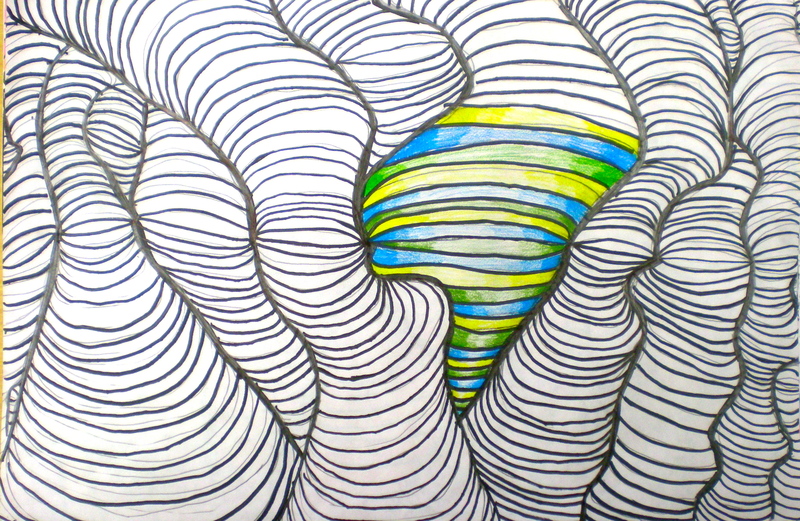 I understand that some art is abstract, only using colors, lines, and shapes. I can paint concentric circles. 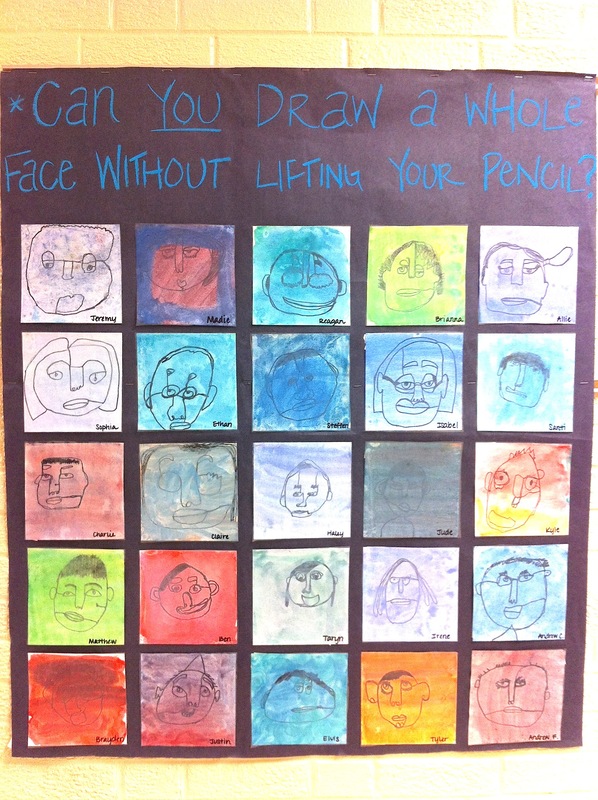 I saw this idea on Art with Mr. E and thought it was so cute and brilliant! I LOVE teaching about the color wheel and color theory because we get to explore color mixing in new ways and knowing color is so important not only in the art field, but essential to many careers in our creative and global economy! My absolute favorite tool is this video by OK GO originally made for Sesame Street – I show it Kindergarten through 6th grade…it is catchy and done in Stop Motion Animation, so it’s funky to watch. 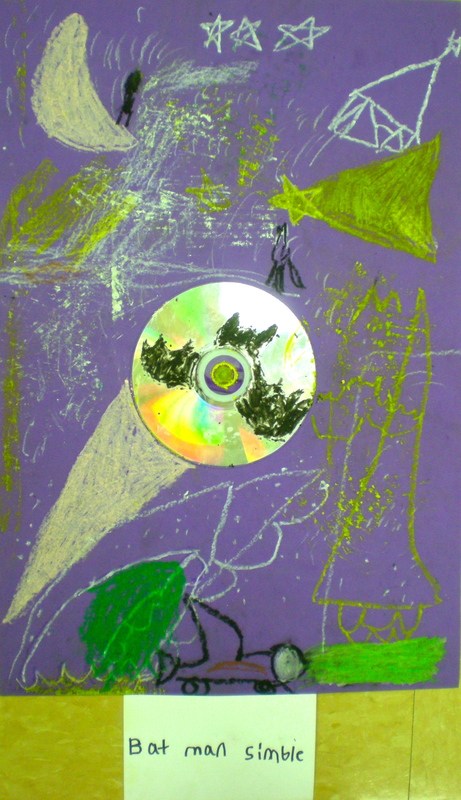 We also read White Rabbit’s Color Book by Alan Baker, and manipulate a magnetic color wheel up on the white board. The real magic comes when the kiddos actually get to create the secondary colors (orange, green, and violet) using only the primary colors (red, yellow, and blue) I’ve given them. 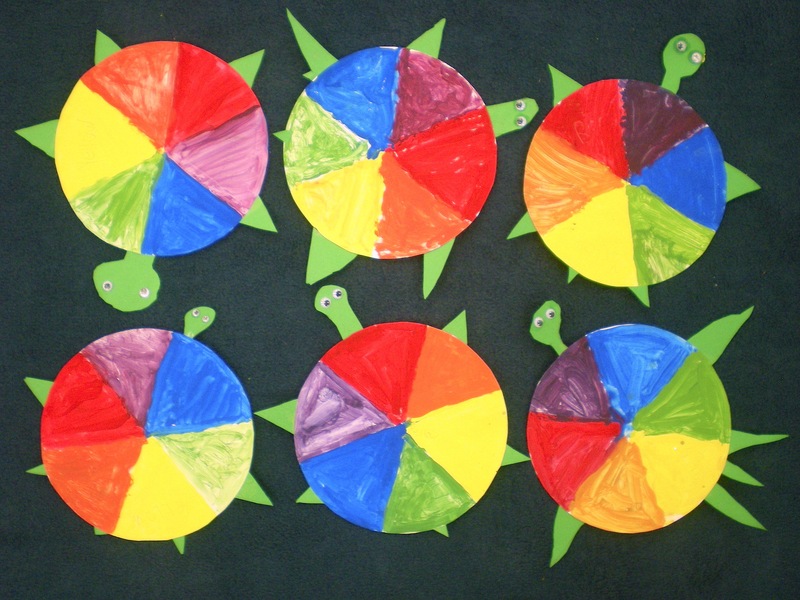 After the color wheels have dried, we add the green construction paper for the turtle parts, and the final touch of googly eyes! I can identify the primary colors. 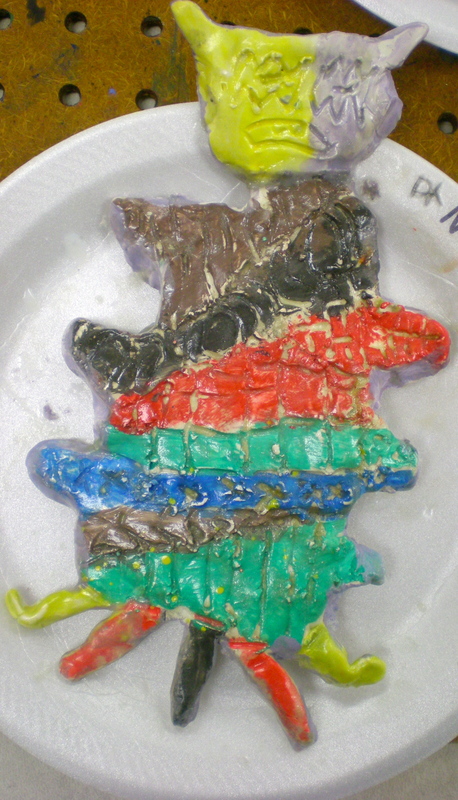 I can identify and mix the secondary colors. 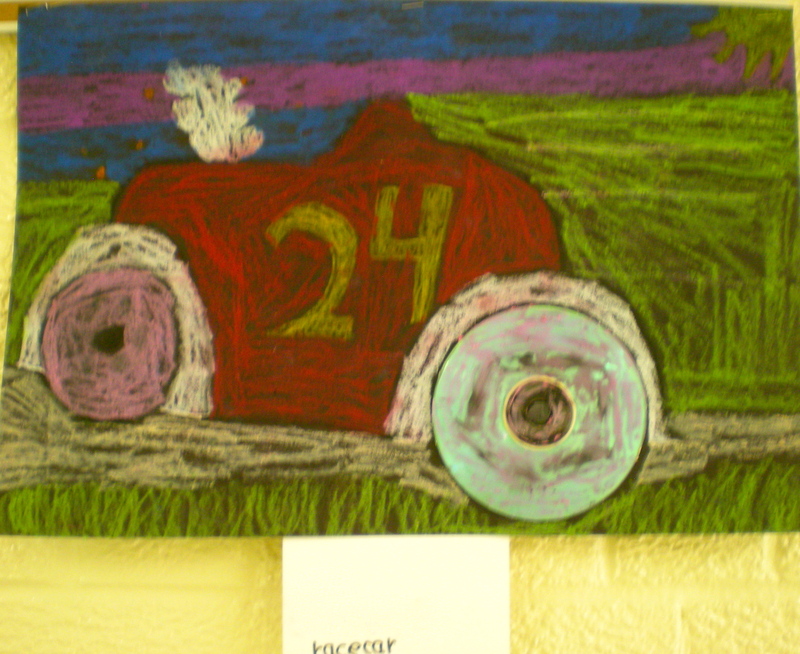 I understand that mixing two primary colors will make a secondary color. I can paint a correct color wheel. Check out my original blog!